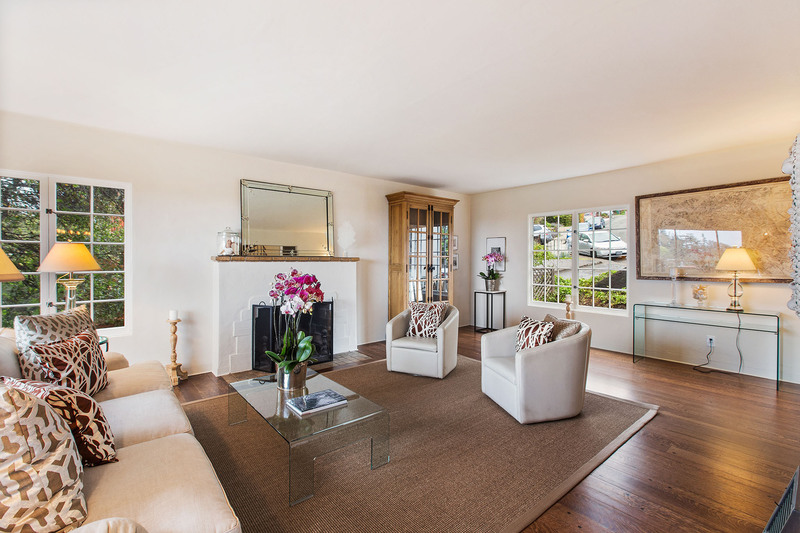 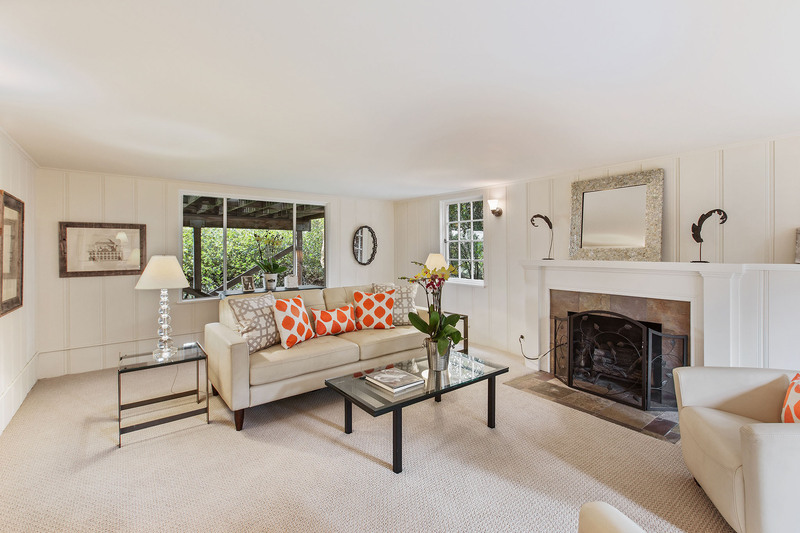 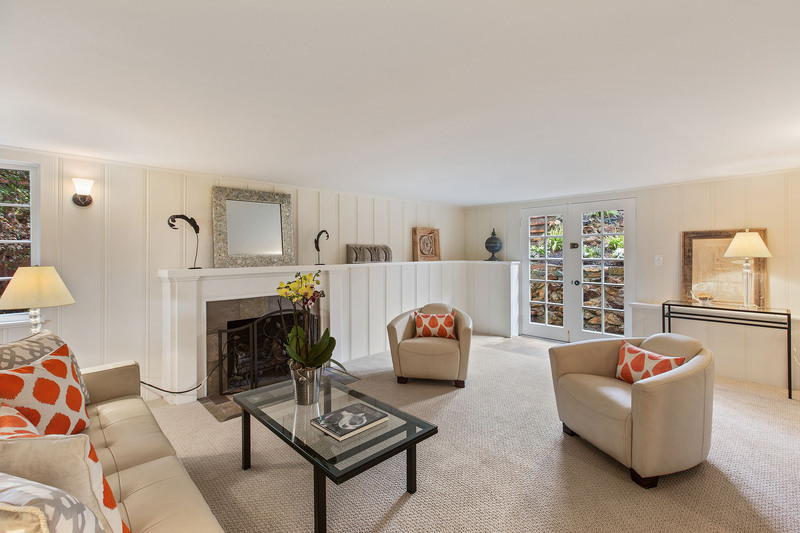 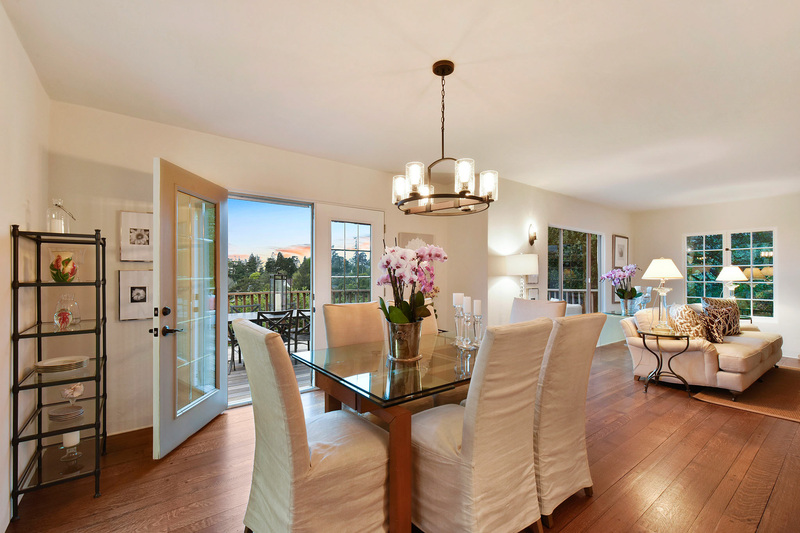 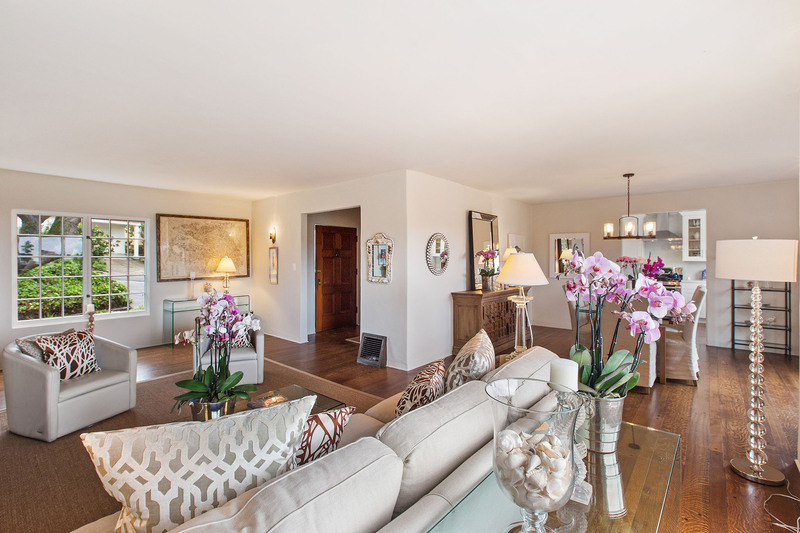 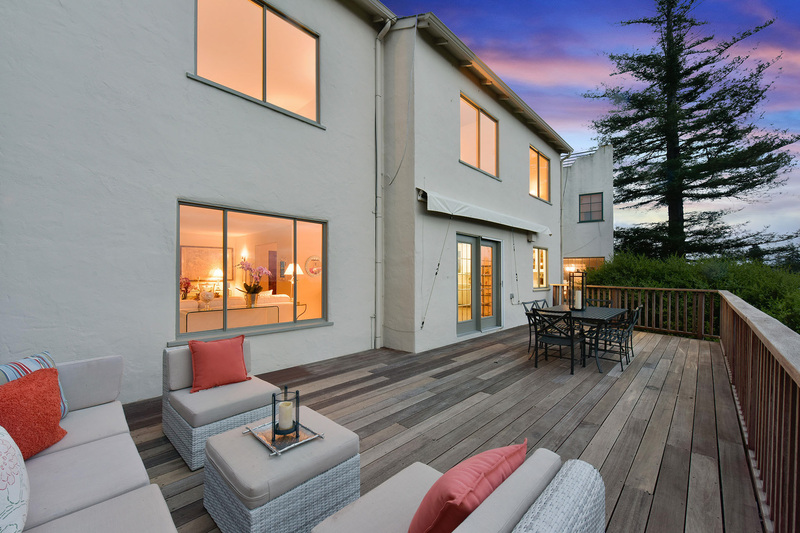 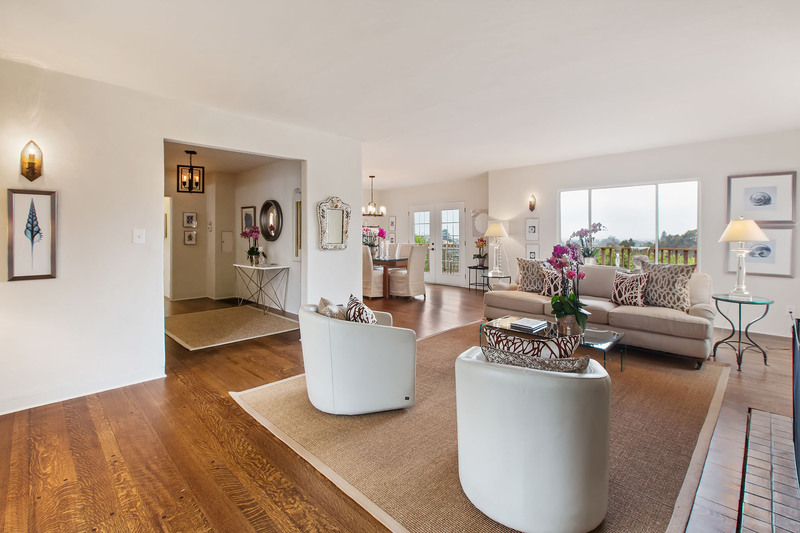 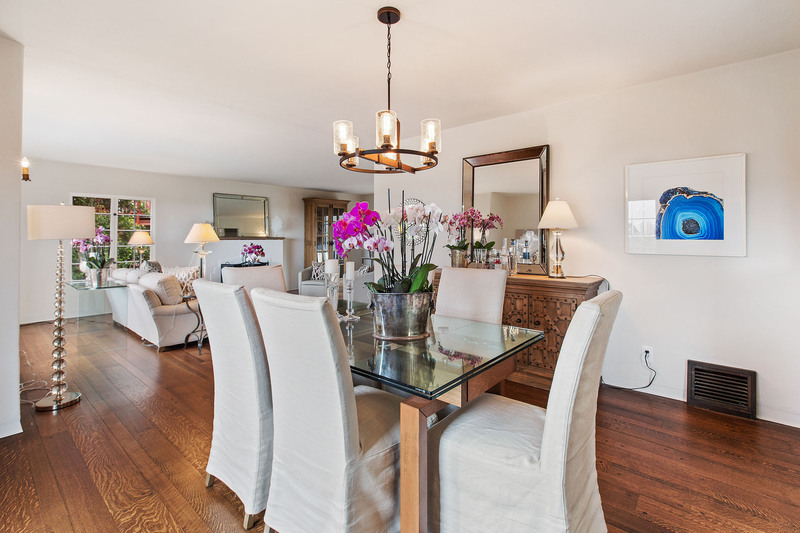 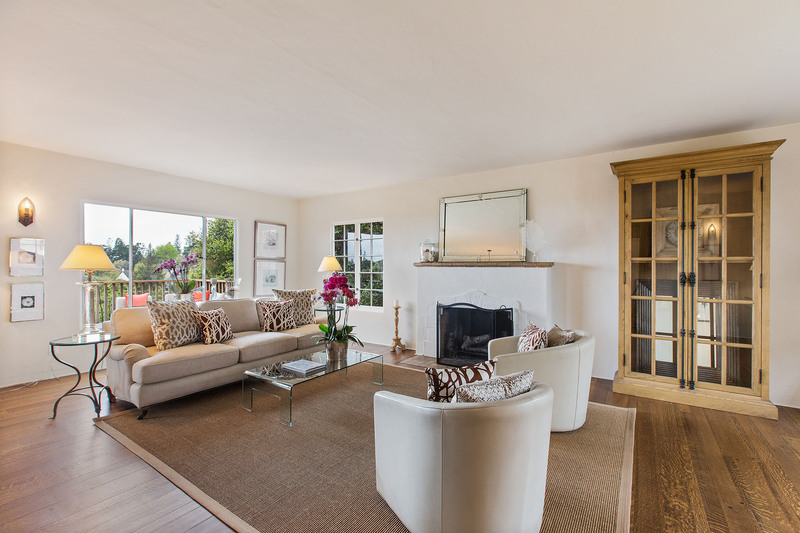 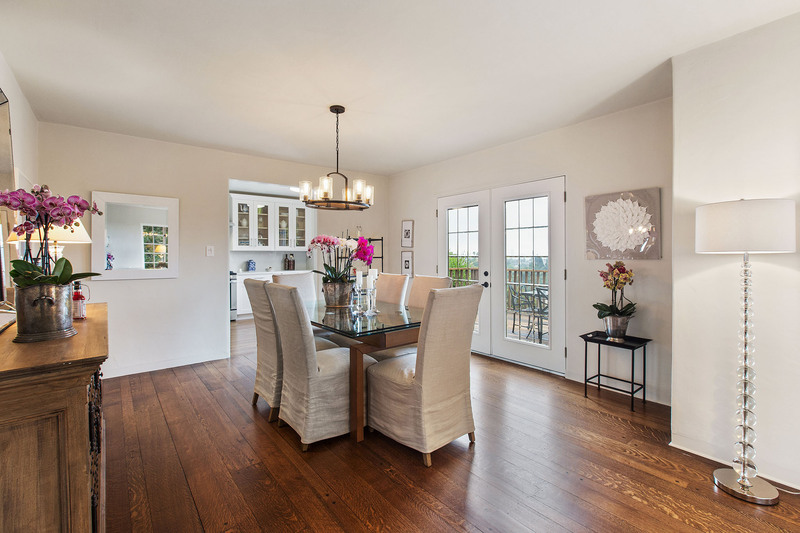 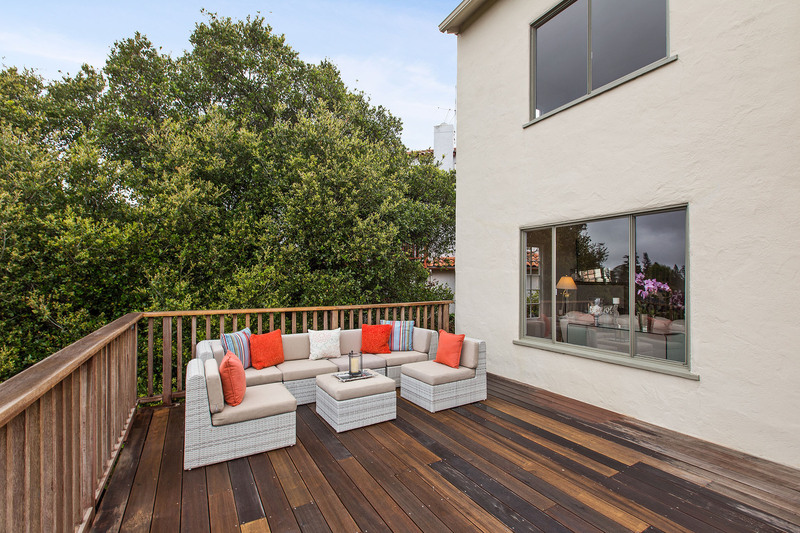 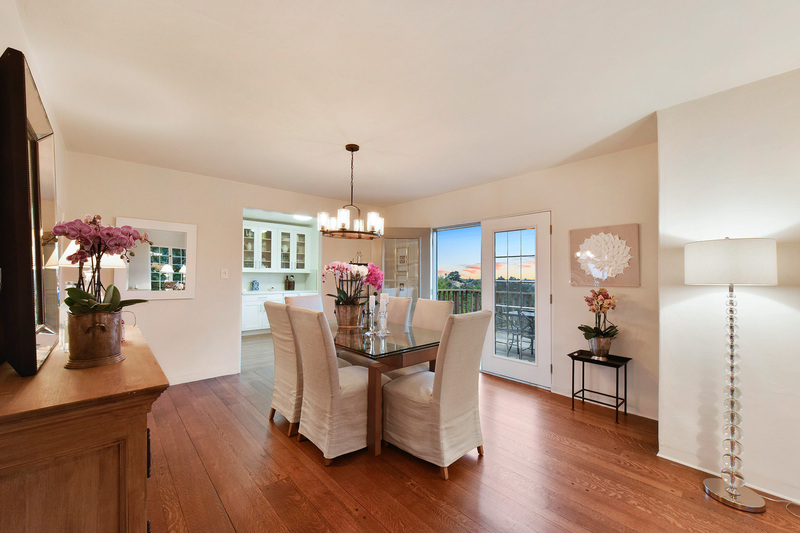 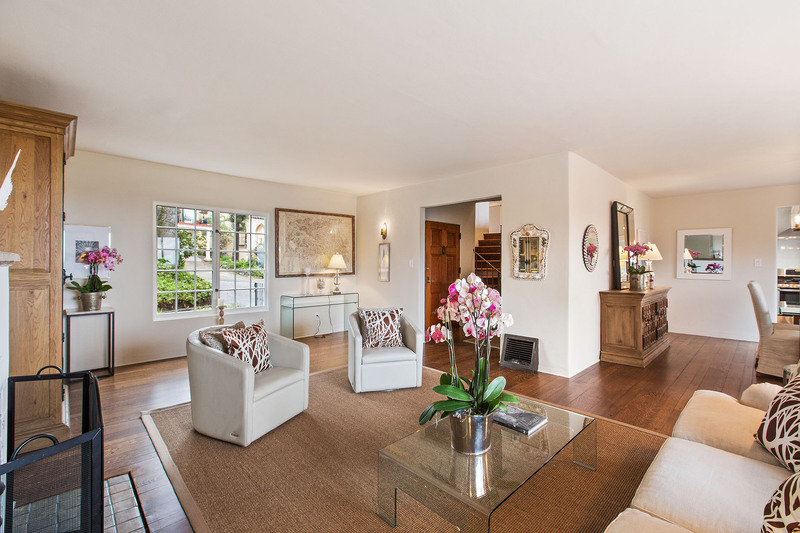 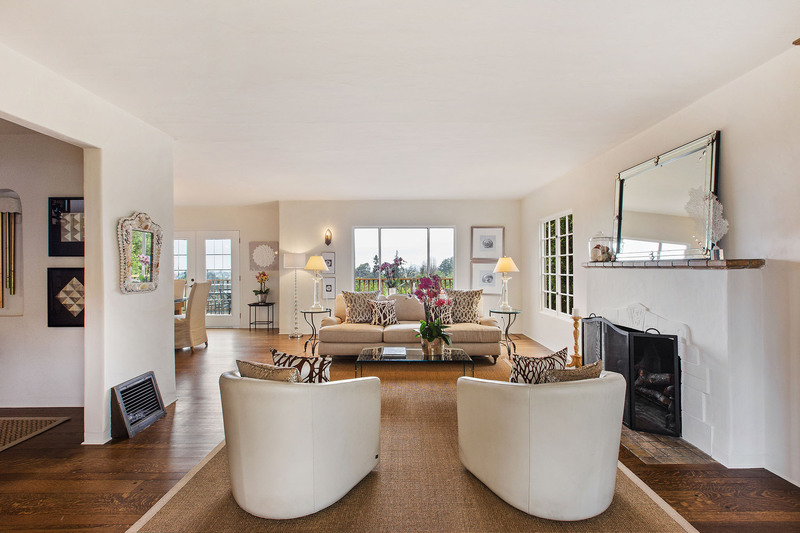 At the intersection of Mediterranean elegant and California easy lives a house grounded in its appreciation of architectural detailing and expansive rooms, enhanced with thoughtful updates that embrace modern living. 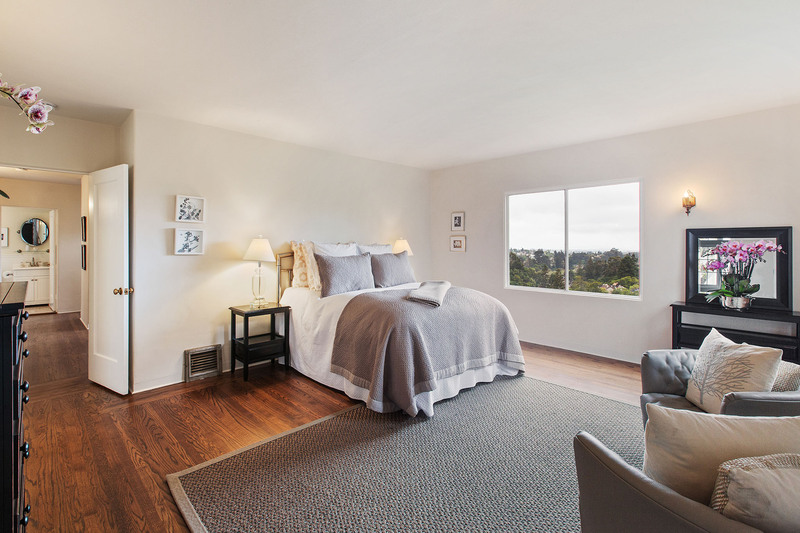 The original rift wood floors are newly refinished, and deliver a warm sophistication paired with the creamy, freshly painted walls — a luxe neutral backdrop for myriad interior styles. 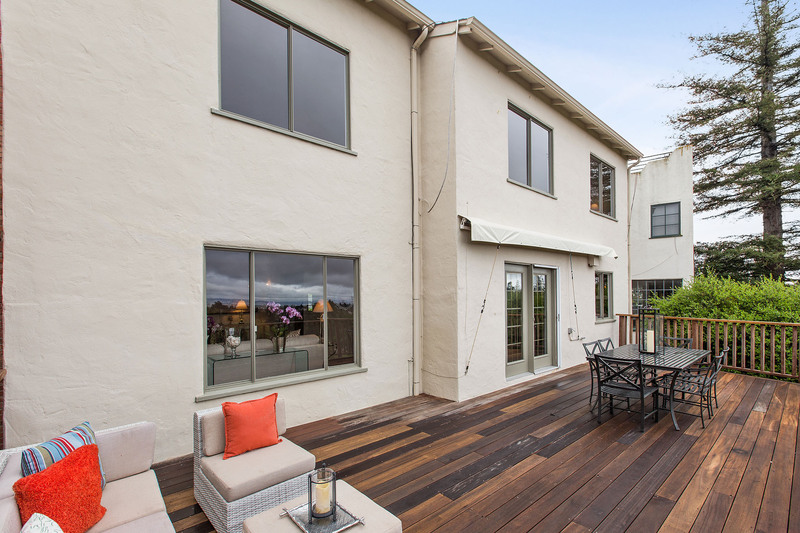 Blurring the boundaries between inside and out are windows and glass-paned doors, offering easy access to the expansive Ipe deck spanning the rear of the house, surrounded by lush greenery and mature oak trees, adding privacy and reminding us that what's outside matters just as much as what's inside the home. 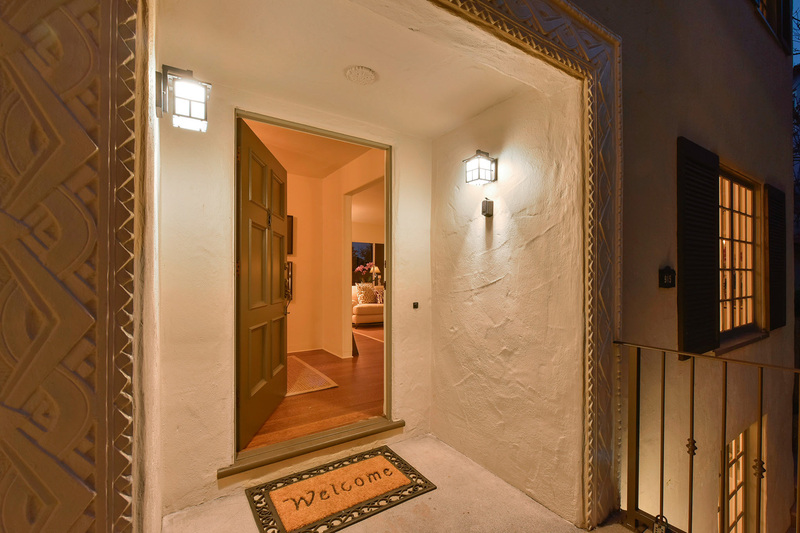 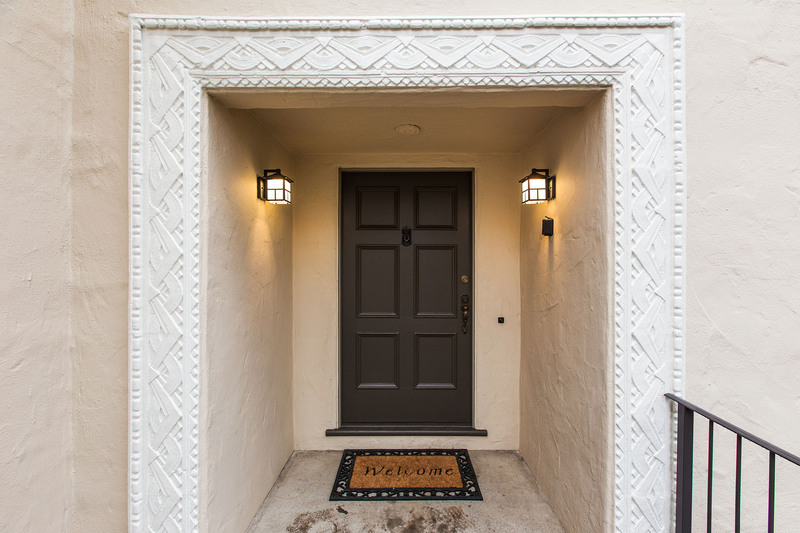 Patterned tile surrounding the front door sets the tone for the Mediterranean aesthetic found inside. 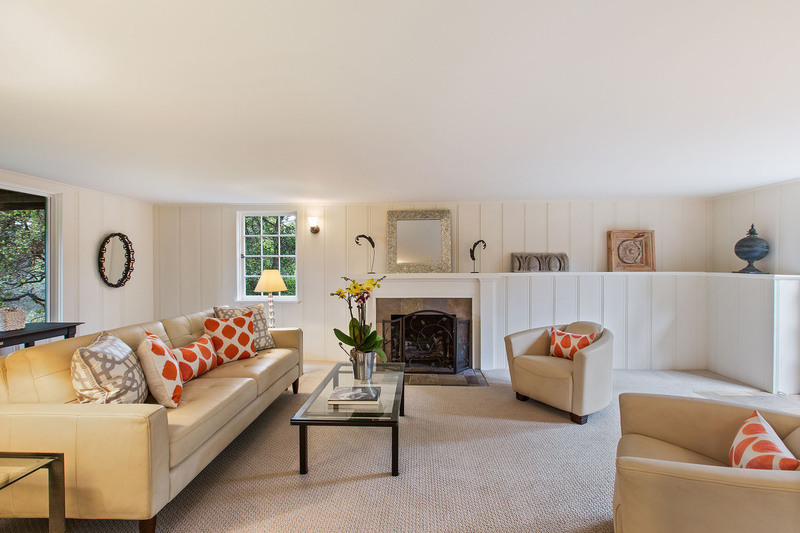 The original fireplace is a subtle focal point of the open living and dining space, with a mantle crafted of tile and simple-yet-statement-making etched detailing. 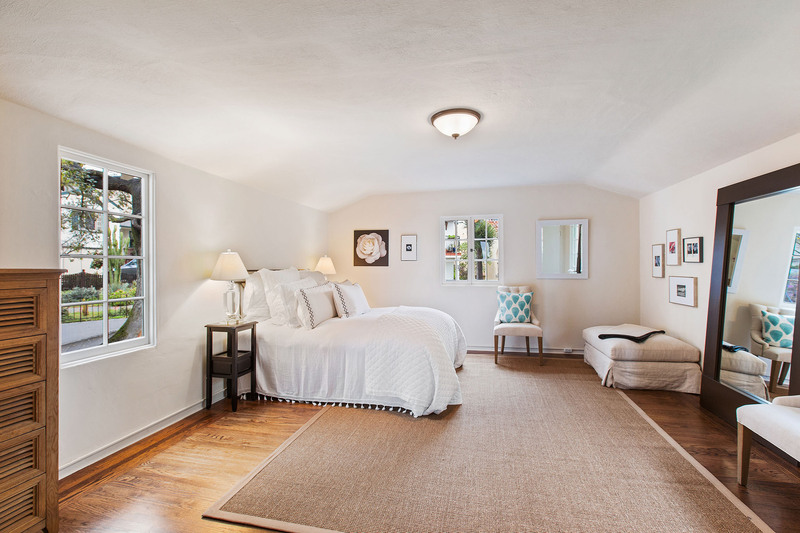 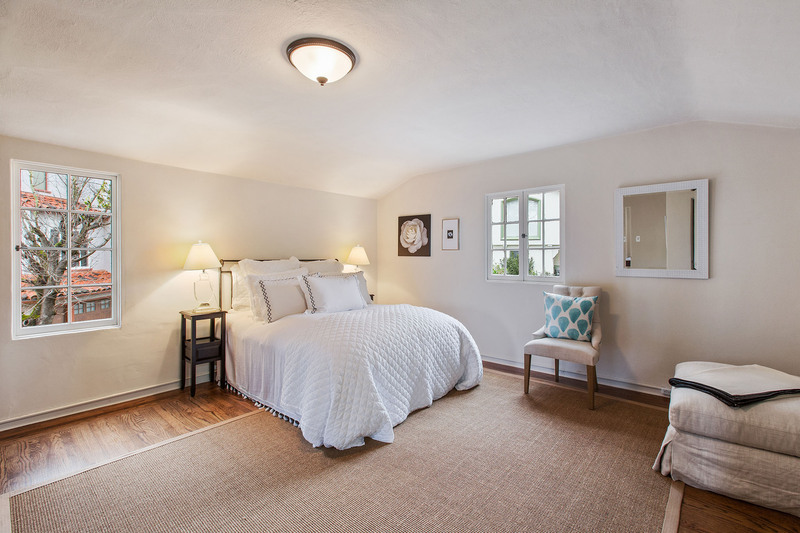 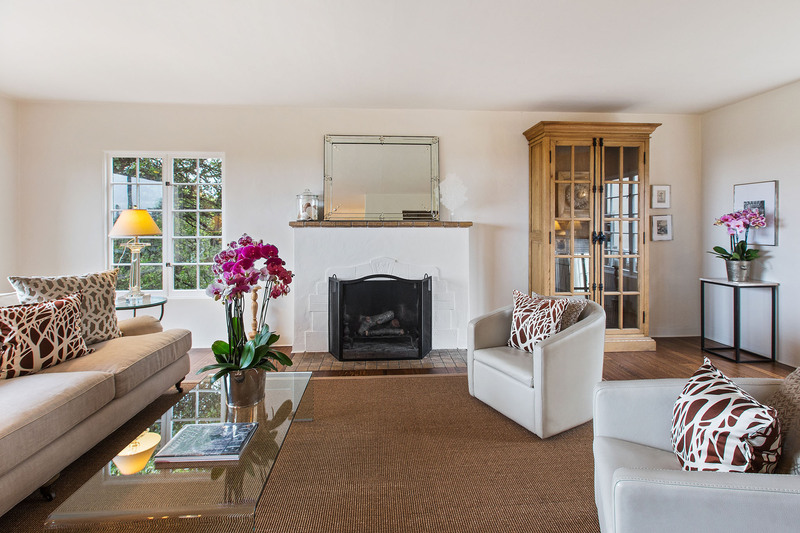 The room just invites relaxation — light-filled and airy, with a very livable California aesthetic beautifully balanced with the period architecture. 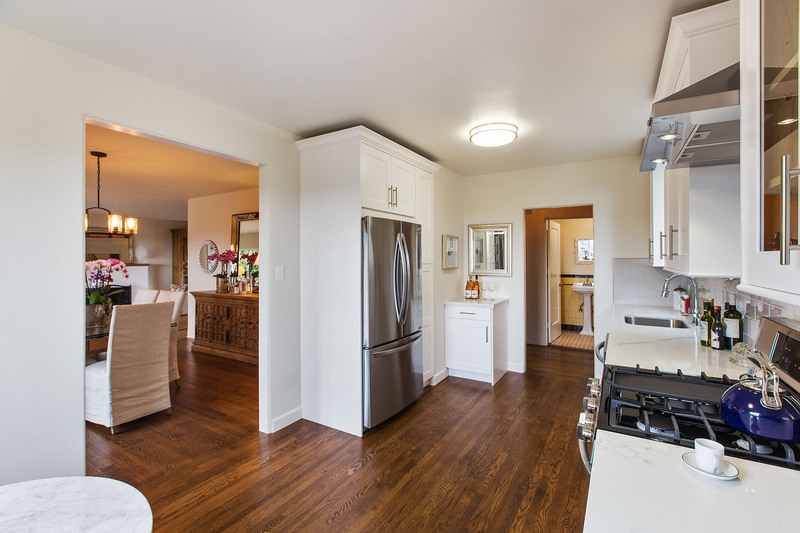 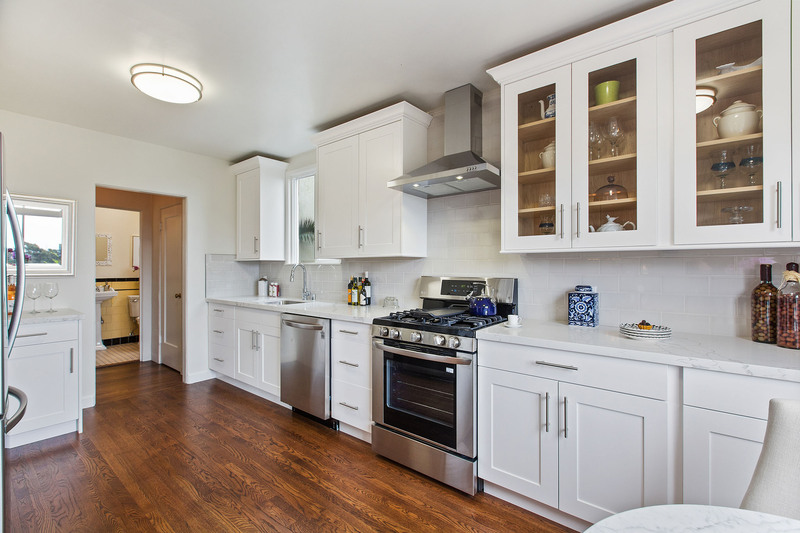 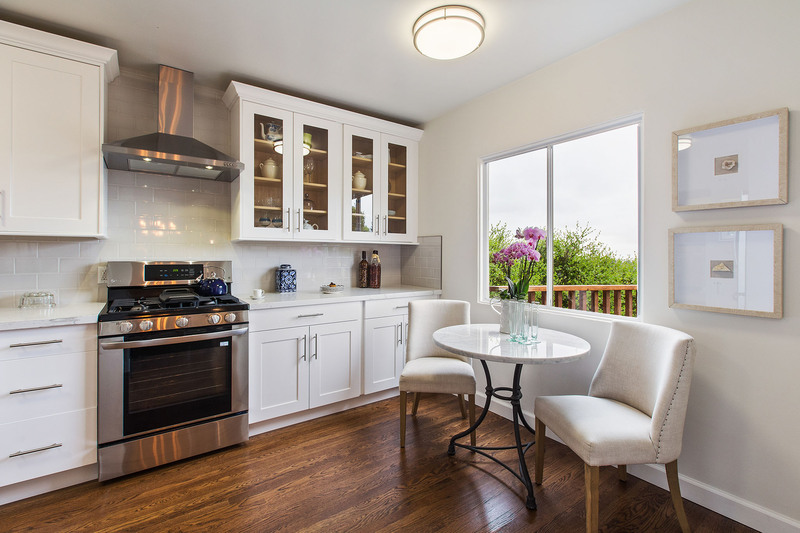 A recent kitchen remodel opened up the space while preserving the existing framework, inviting family and friends to gather. 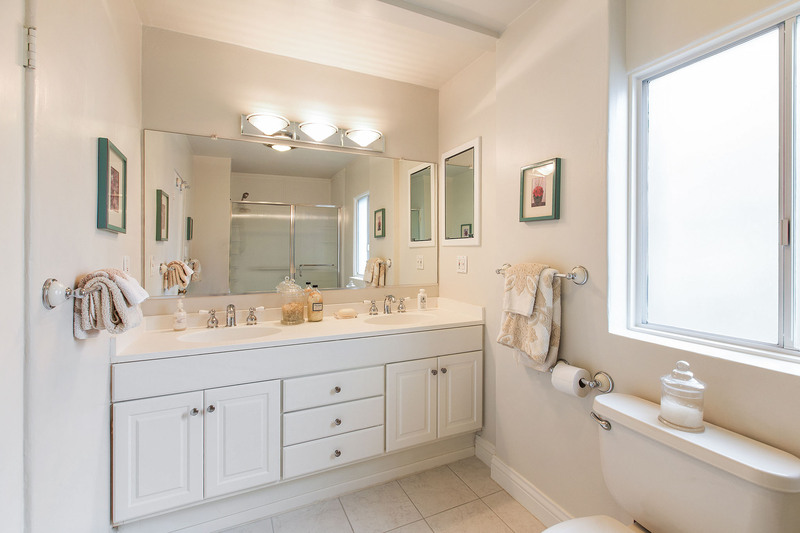 Keeping materials relatively simple, the timeless palette of white and pale grey is reflected in the Calacatta marble-style quartz countertops, stainless appliances, glass-fronted white cabinetry and subway tile backsplash — focusing on high-end, durable materials that are functional, friendly and fashionable. 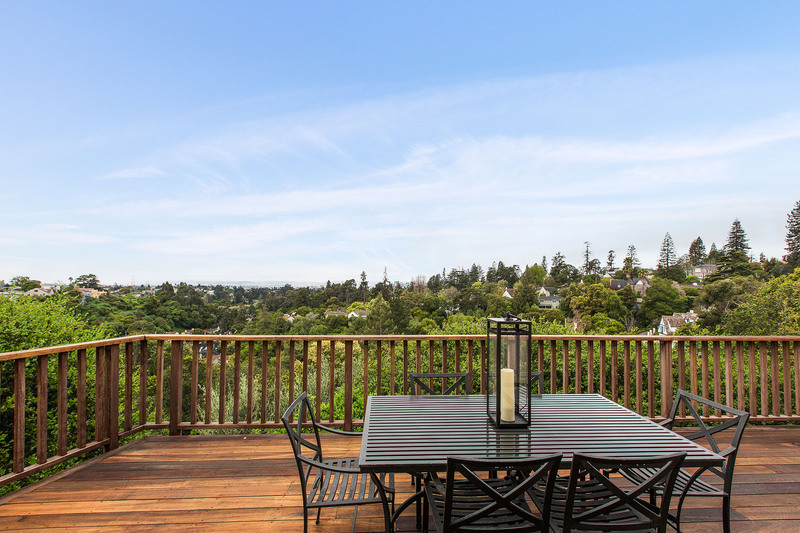 The sunny breakfast area is a perfect spot to start the day off right, looking out to city views over the deck. 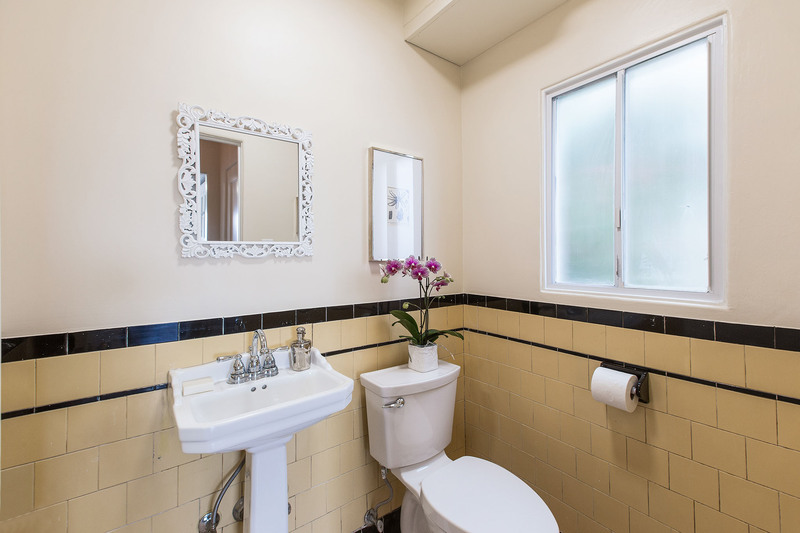 A powder room is clad in original yellow and black tiles, a reminder that the 1930s brought color to bath design. 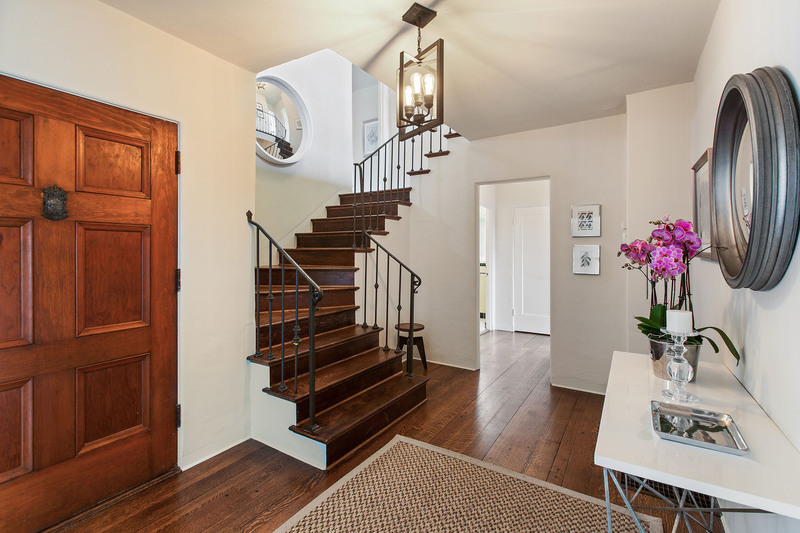 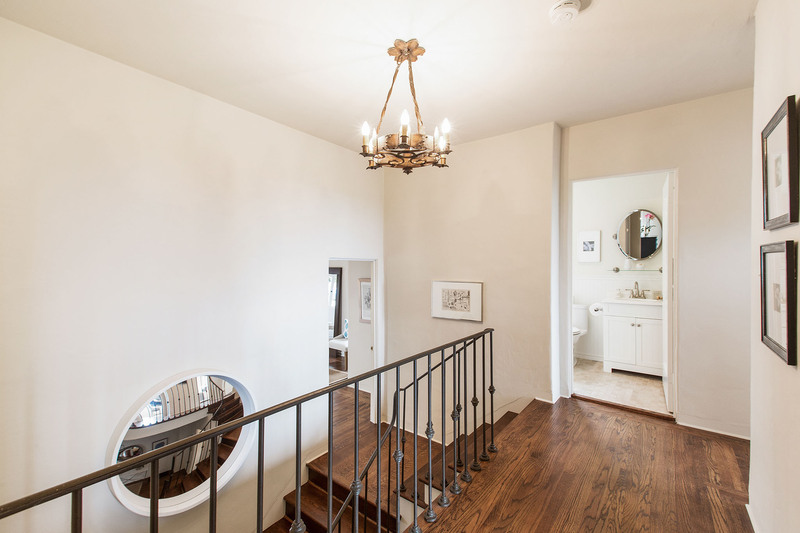 An elegant, captivating staircase — with an exquisite wrought-iron banister — leads to the second floor. 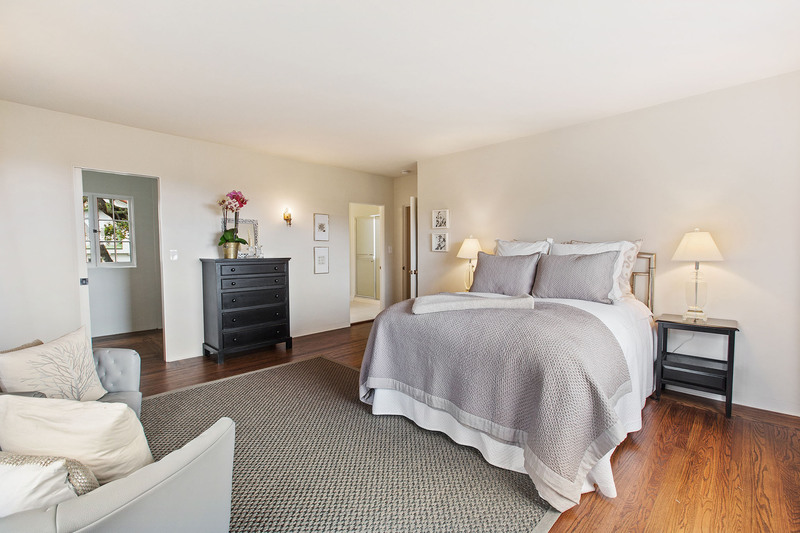 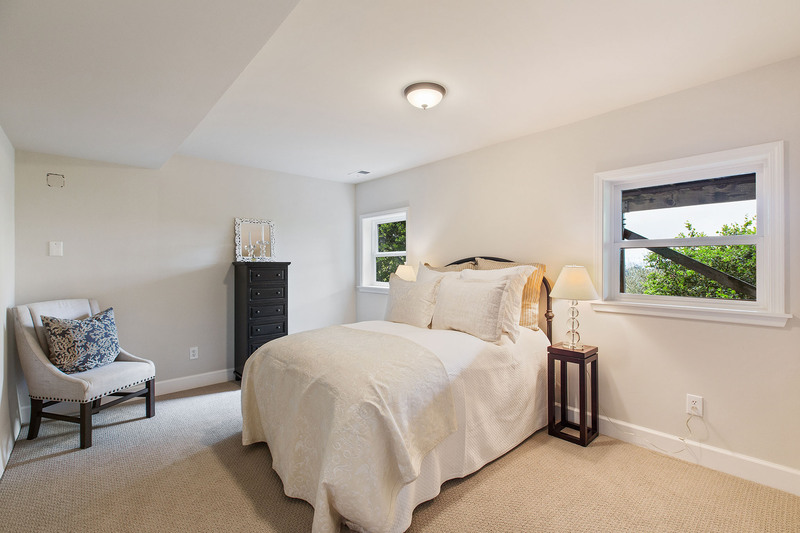 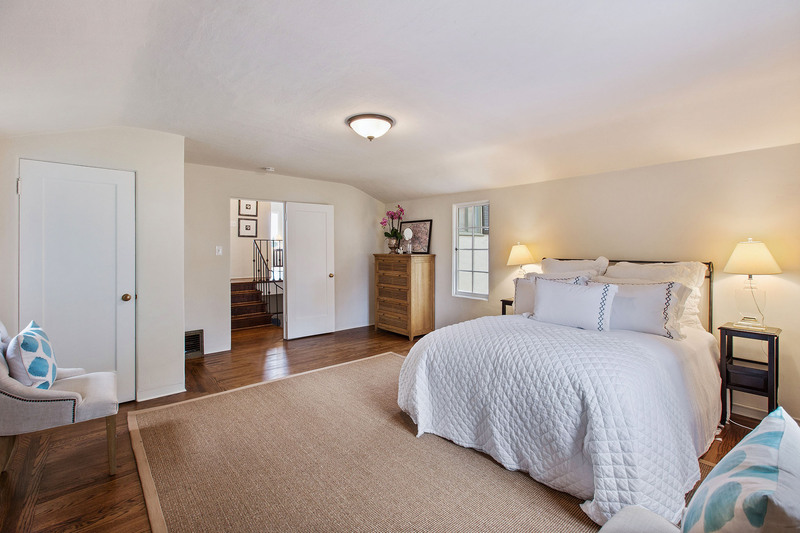 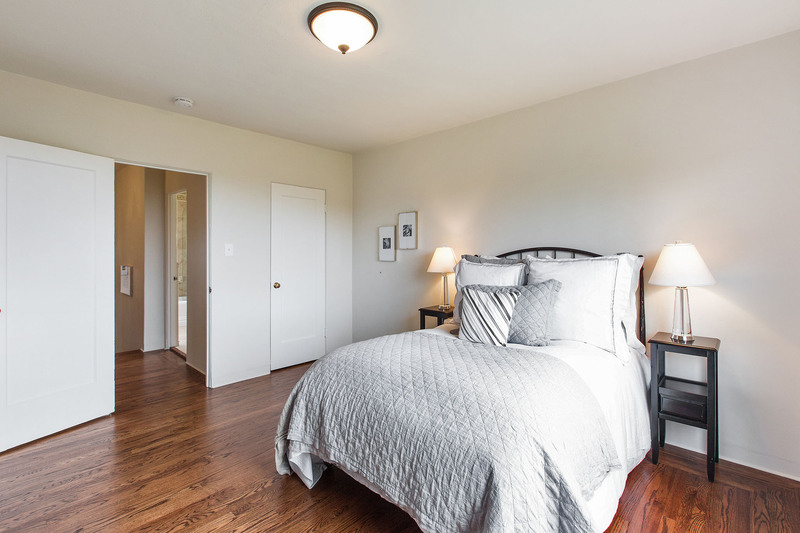 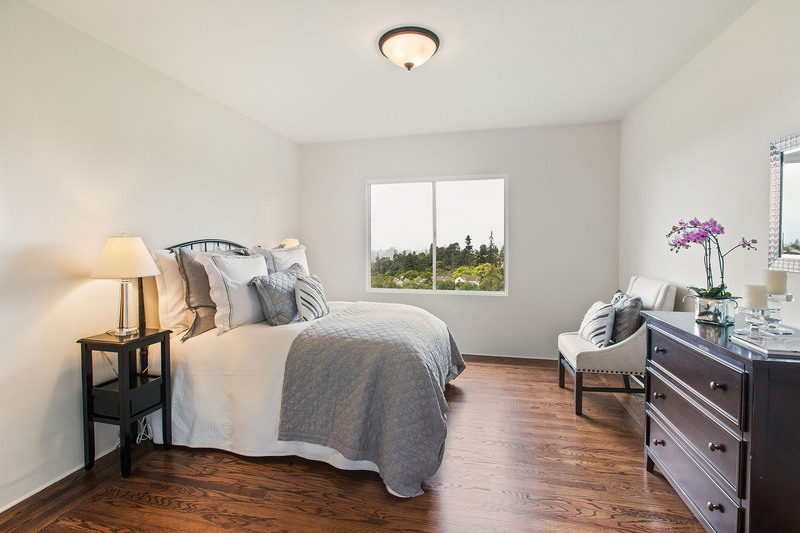 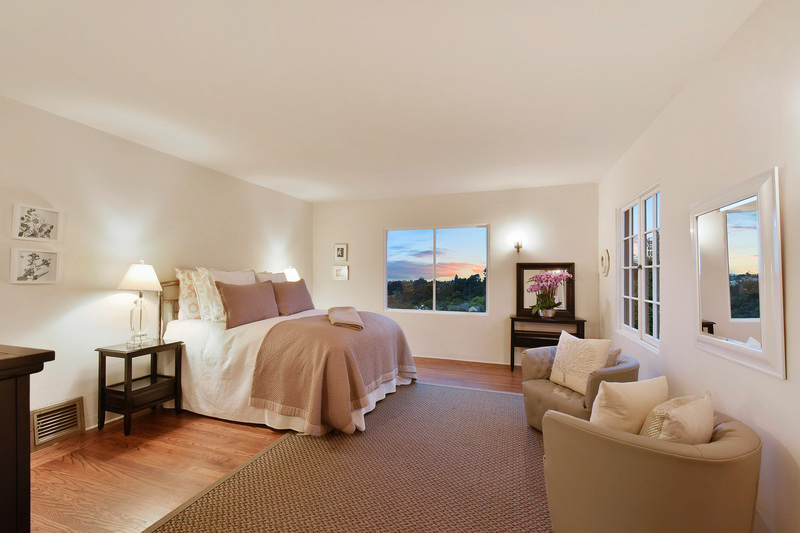 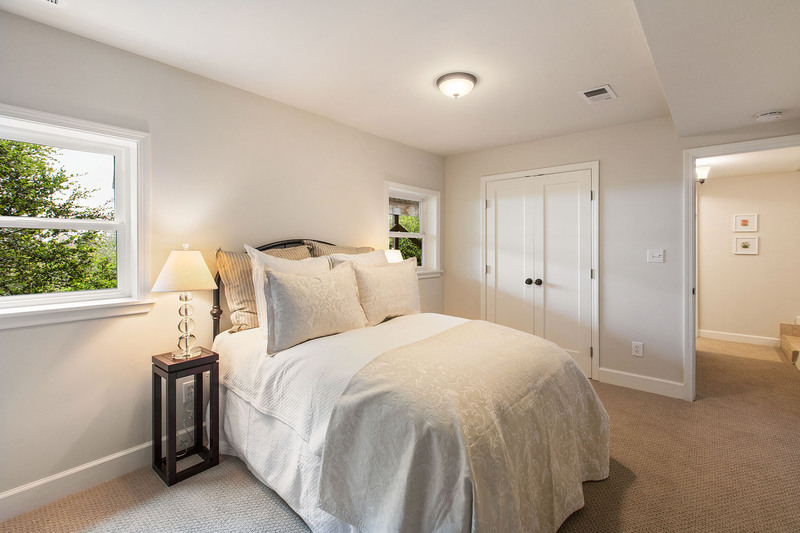 Soft, natural light takes center stage in the private bedroom off the first landing, helping to craft a peaceful environment under a gently coved ceiling. 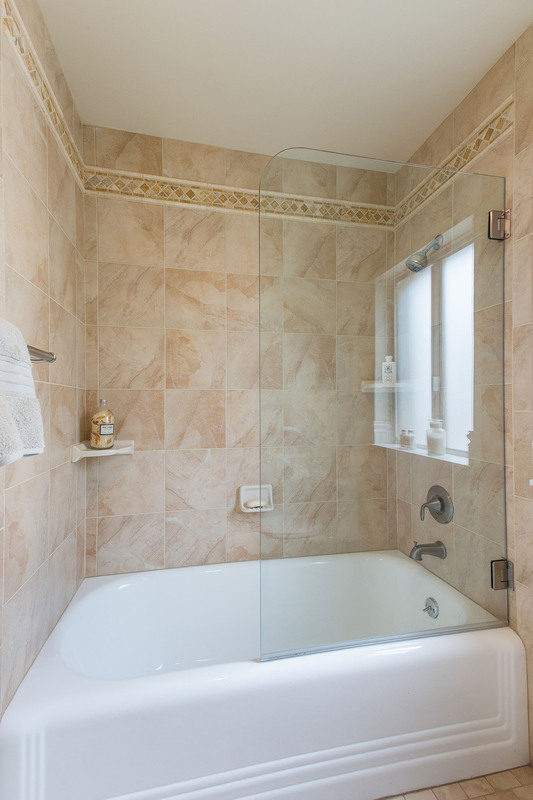 A few steps up to the full upper floor, the hallway bath was designed in a neutral palette of different textures and shades create a calming space. 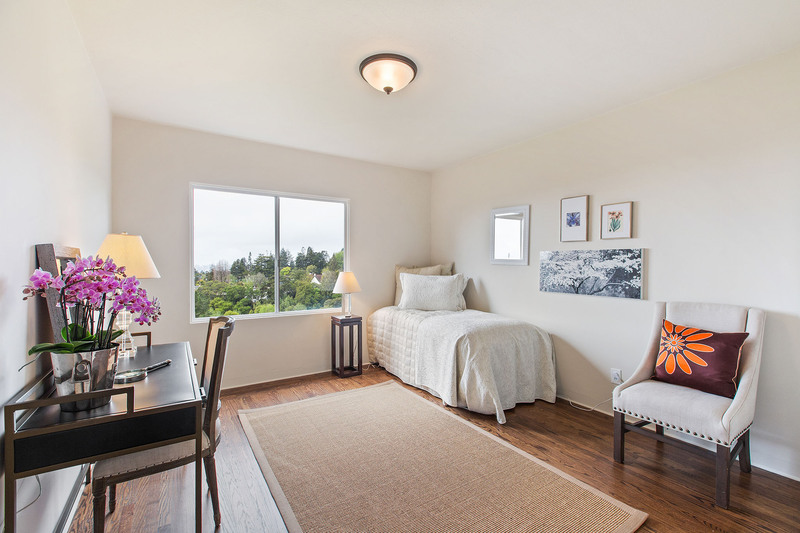 Two comfortable bedrooms off the hall are inviting and restful, with spots to read or relax under the sunshine-filled windows. 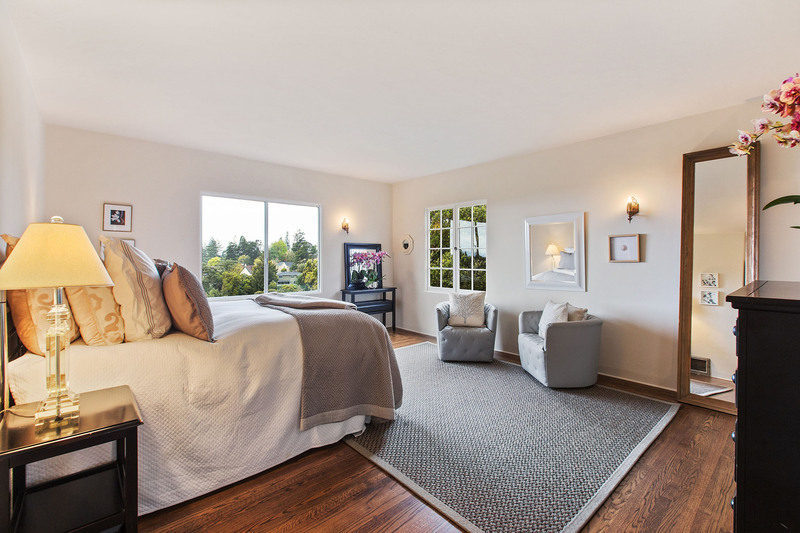 Reflecting the outside in, the windows of the spacious master bedroom look out to the verdant green and city views beyond. 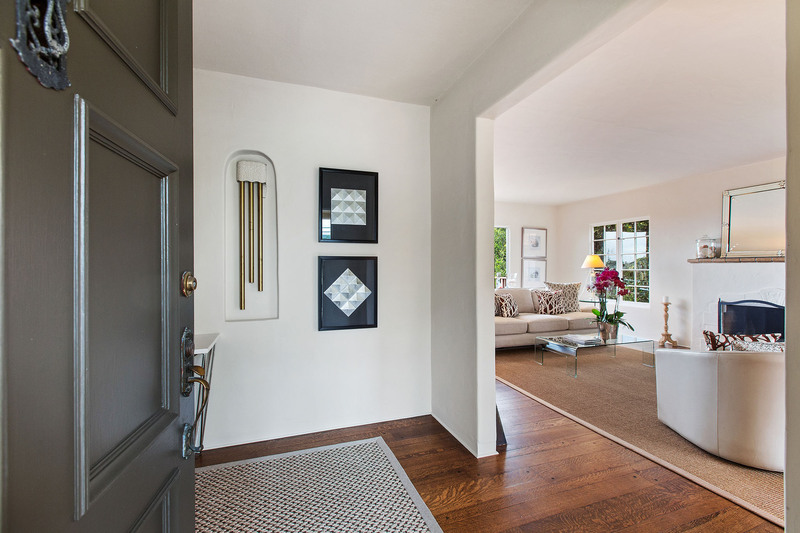 The dreamy interior is elevated with glamorous original 1930s sconces and subdued, timeless wall color; a big walk-in closet lends a welcome contemporary touch. 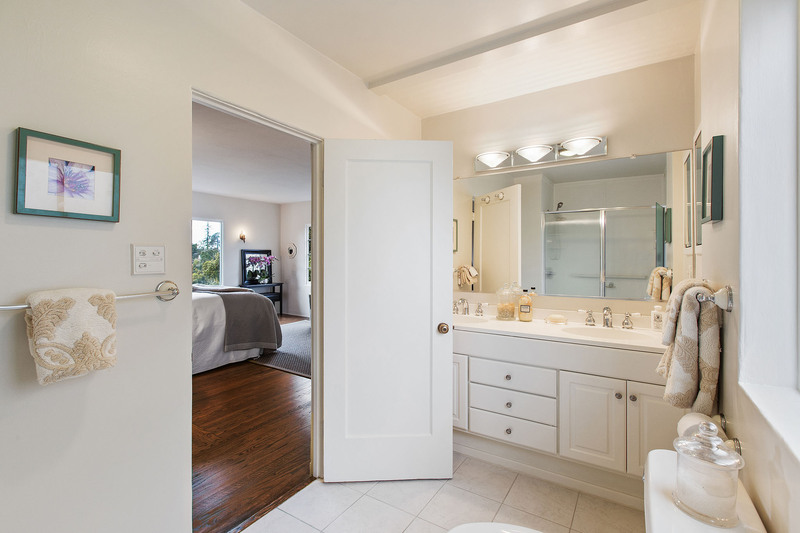 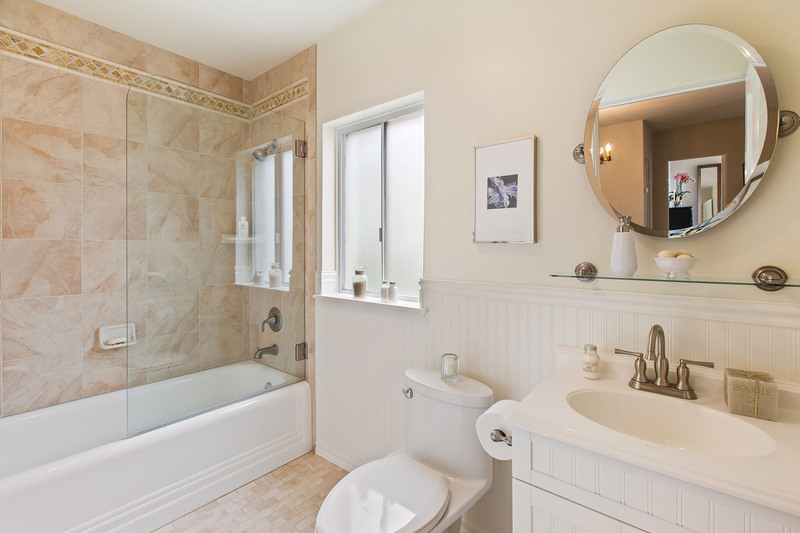 The large en suite bath with a double vanity and walk-in shower — plenty of room for two, in soothing neutral hues. 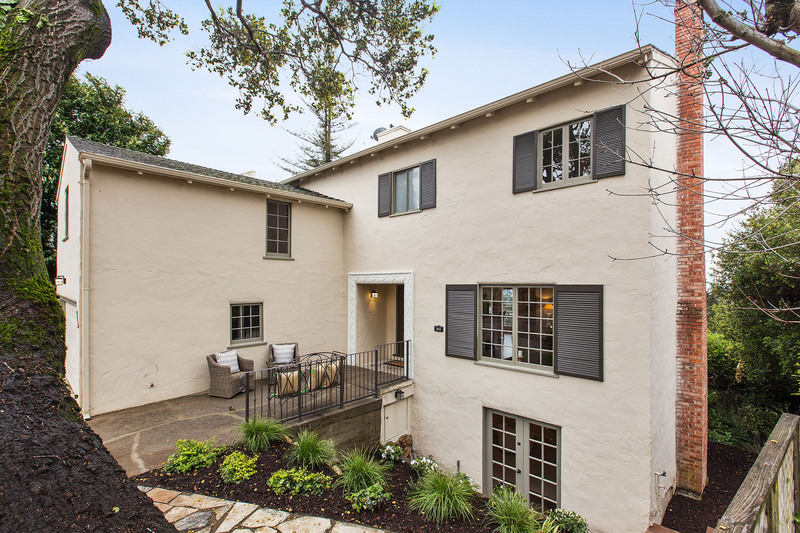 Built in 1935, with four spacious bedrooms on the upper floor — a sought-after layout for growing families —the (surprise!) 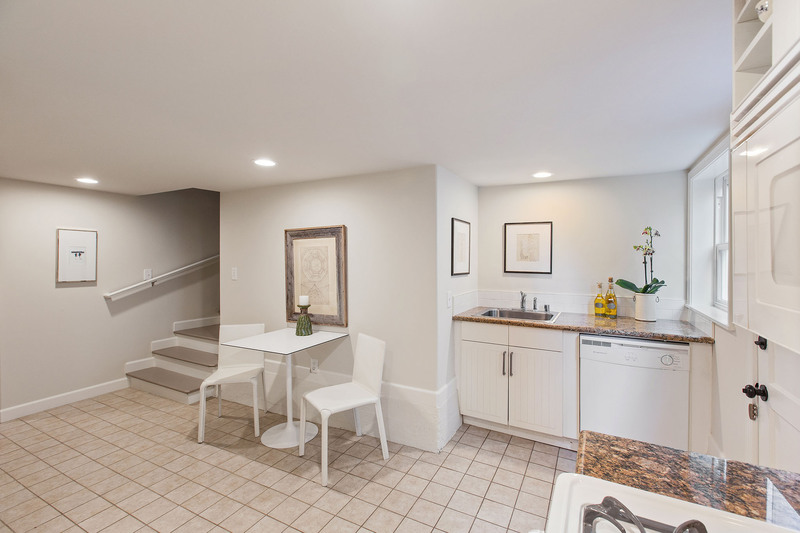 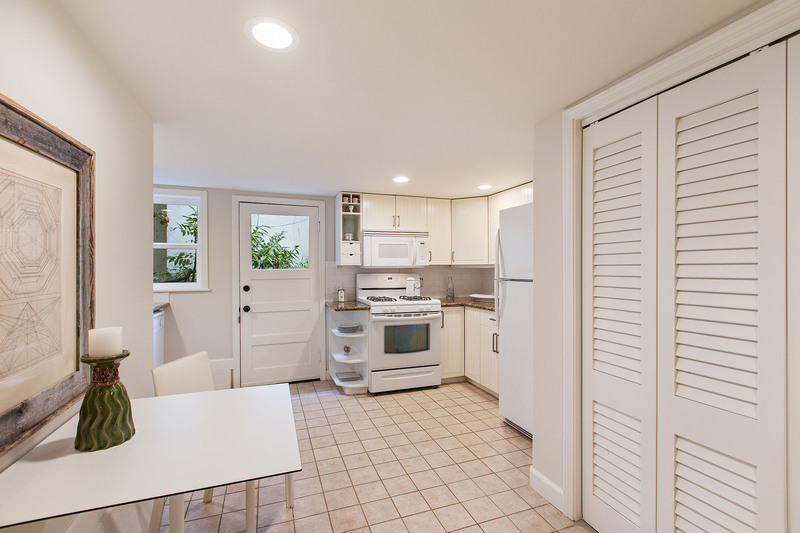 basement bonus space is a cherry-on-top to a timeless, move-in ready home. 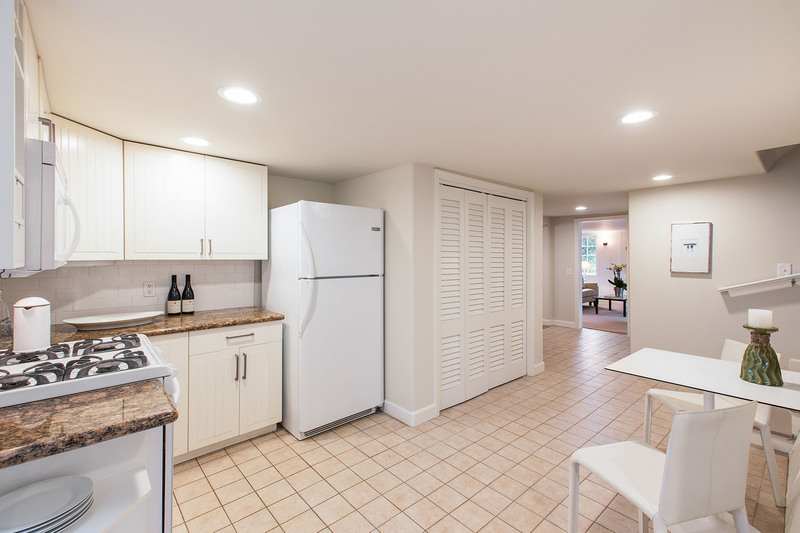 Featuring a kitchen, living area, bedroom and bath, along with a private entrance, the finished space creates opportunities for au pair or in-law … family room, home office, guest suite, or more. 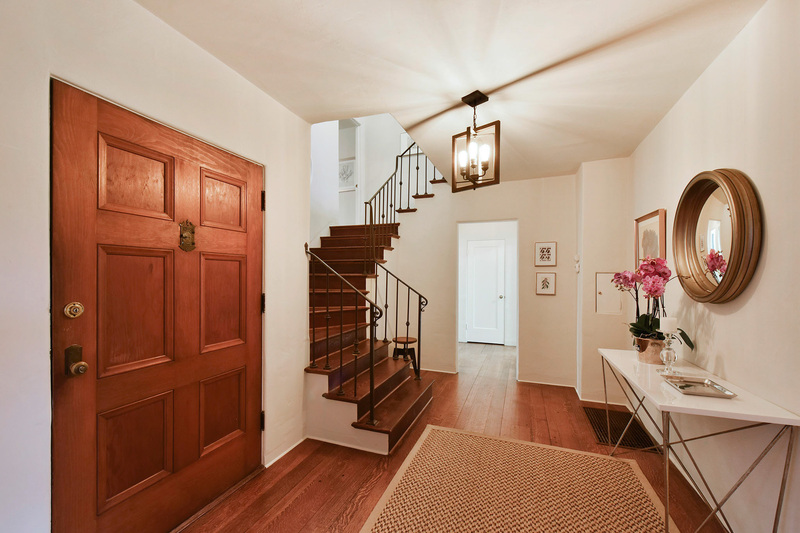 Ample storage throughout the house, and a garage with interior access are welcome practical additions. 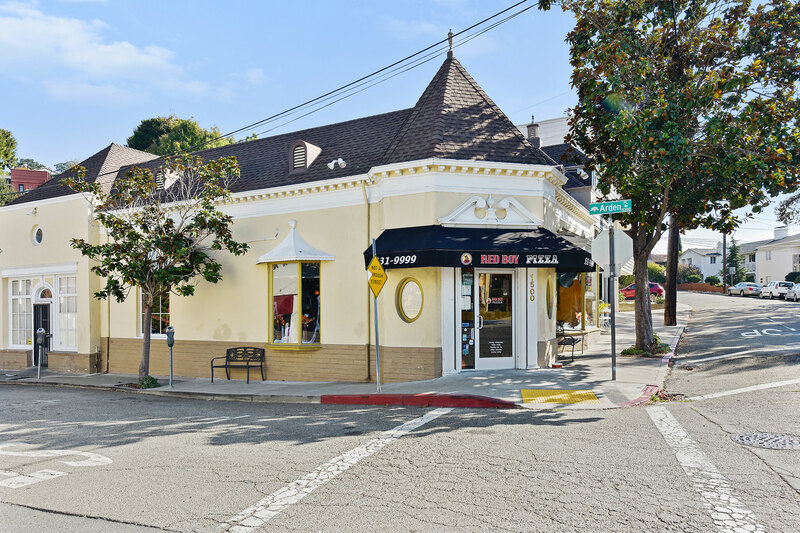 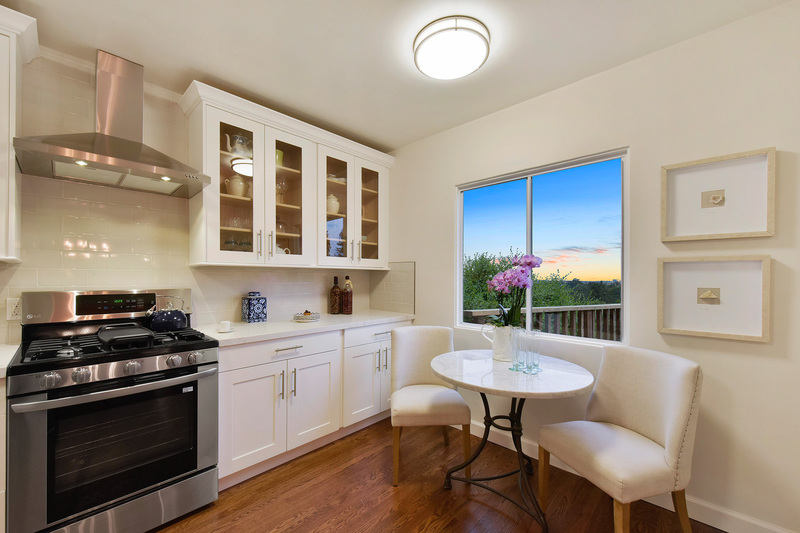 In the heart of Glenview — a neighborhood that feels like a hometown — Glendome Circle offers easy, walkable access on tree-lined streets to the charming shops and restaurants of Park Boulevard, the rambling Diamond Park and historic Leimert Bridge, and local schools. 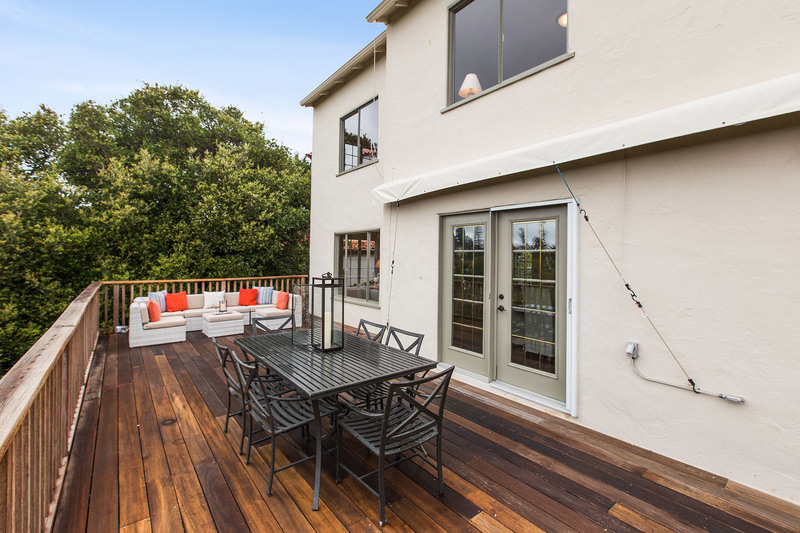 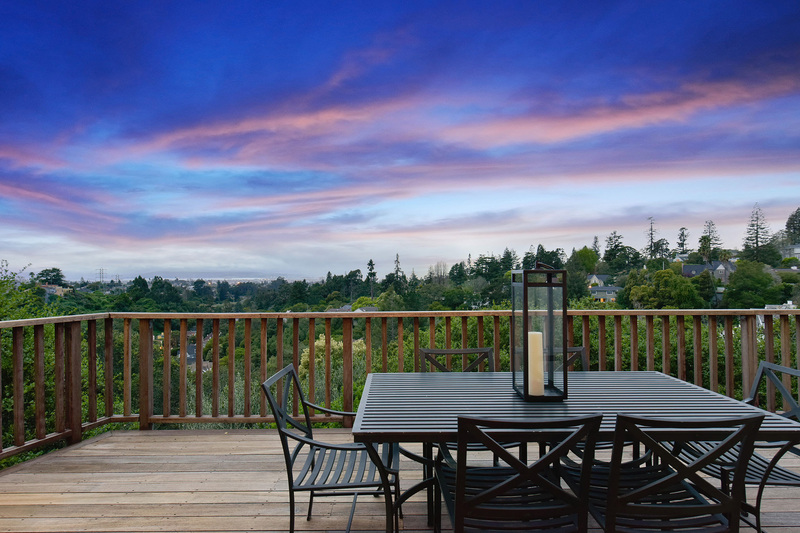 Just twenty minutes from San Francisco, the house is close to the 580highway, the commuter express bus to San Francisco and AC transit, and casual carpool — juxtaposed with wild turkeys and redwood forest hikes nearby. 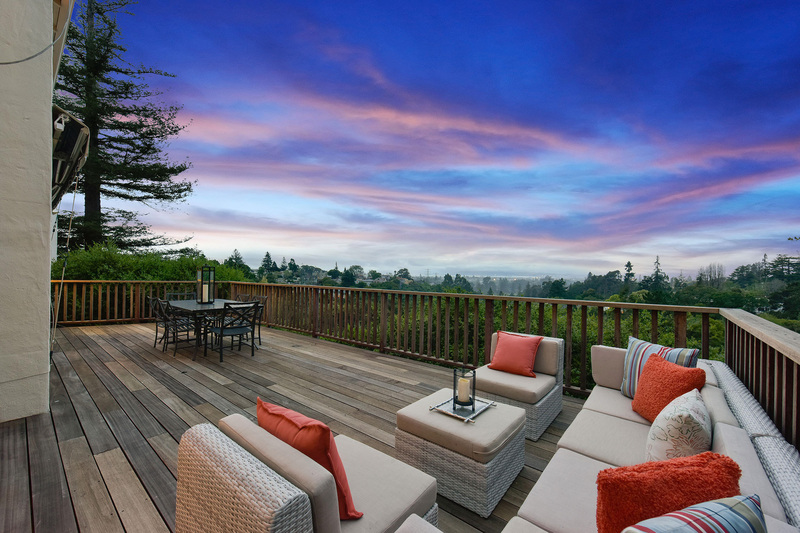 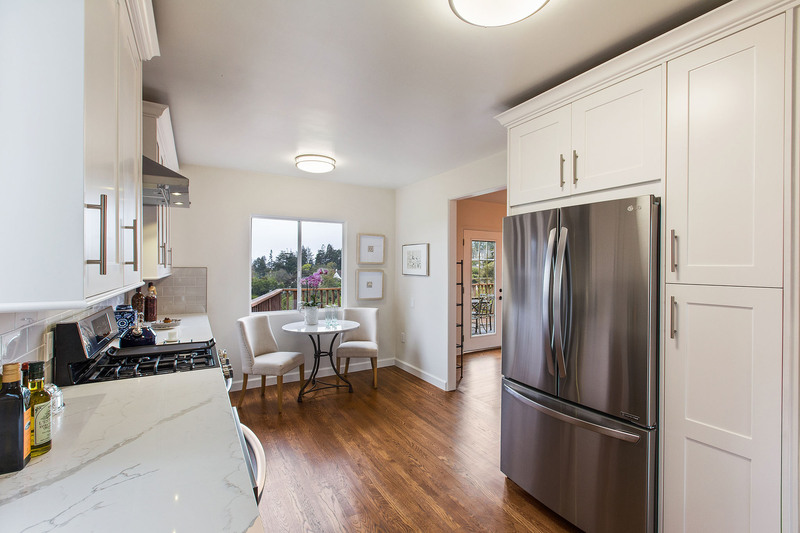 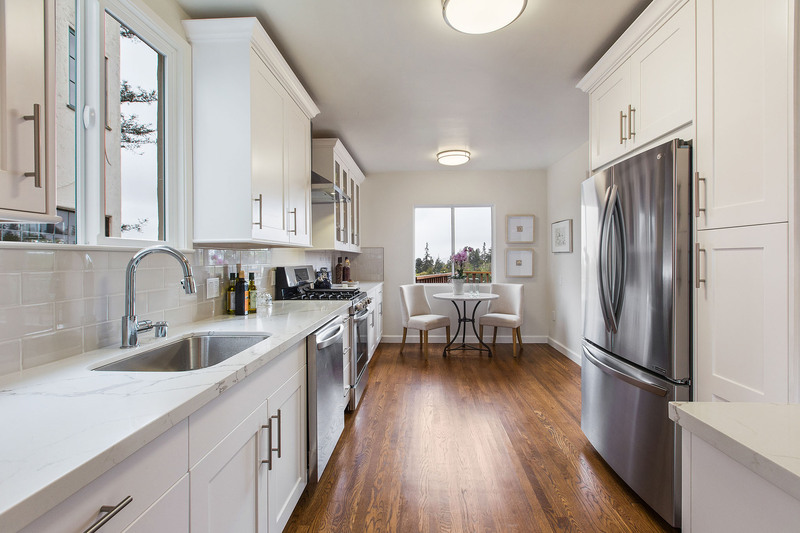 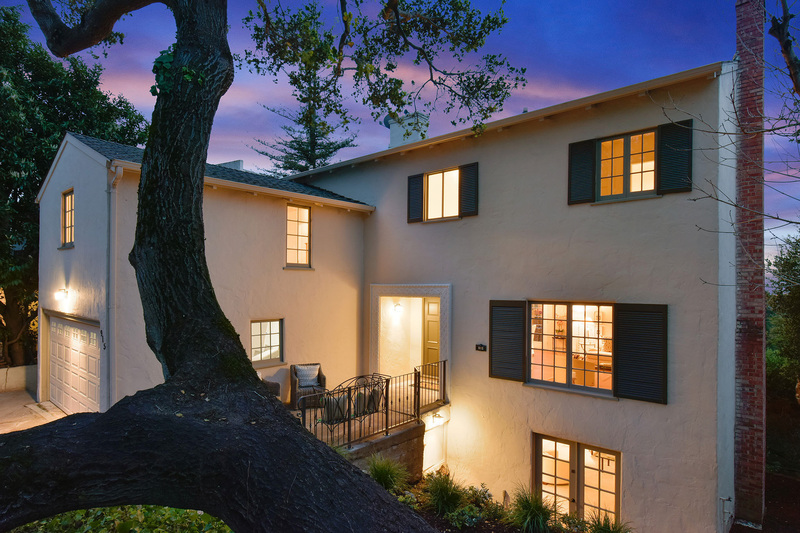 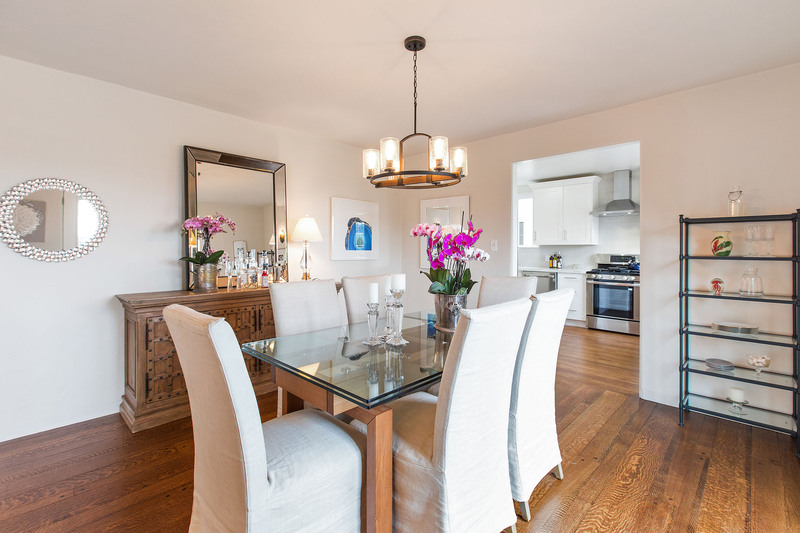 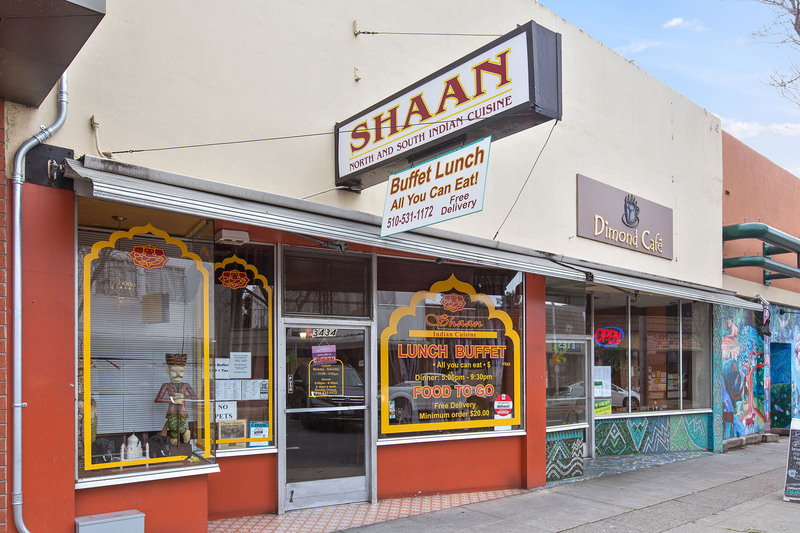 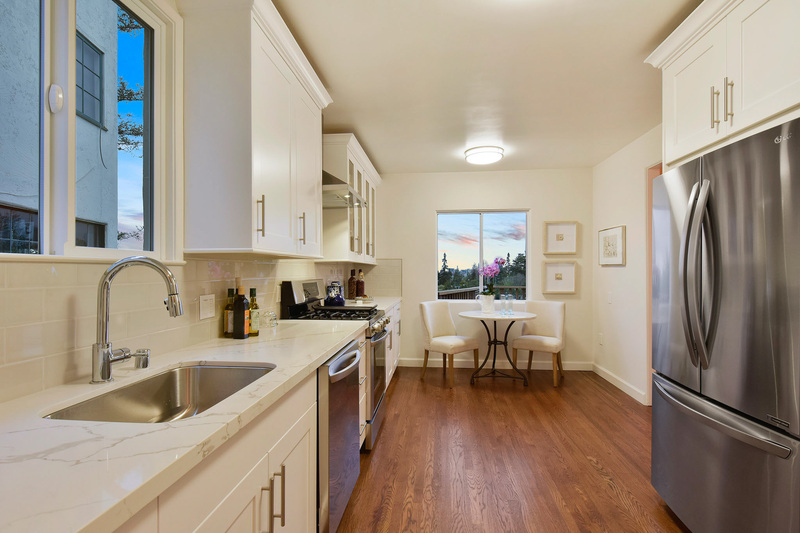 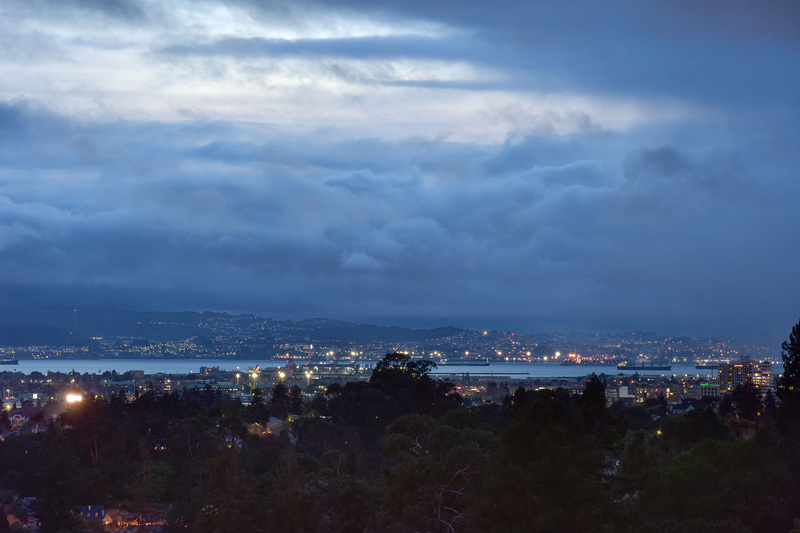 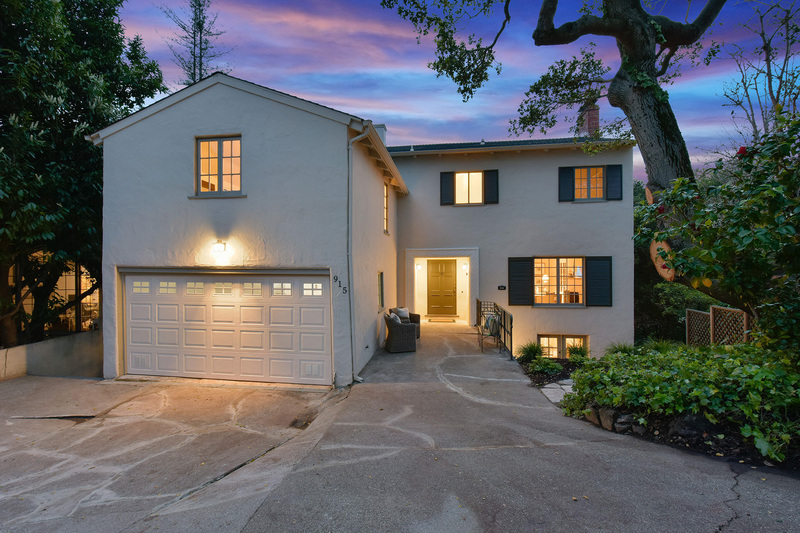 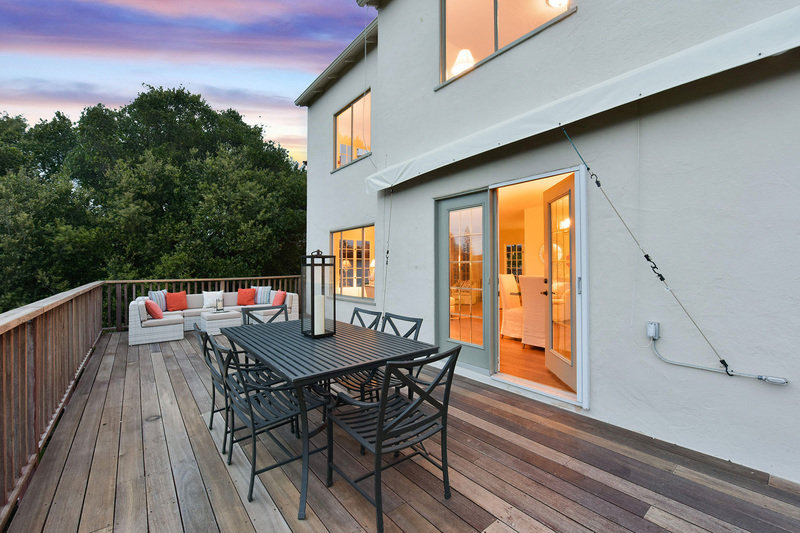 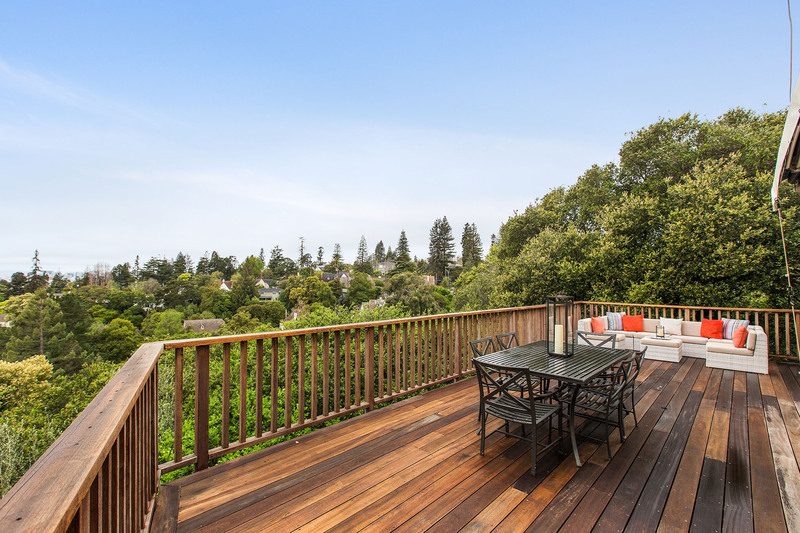 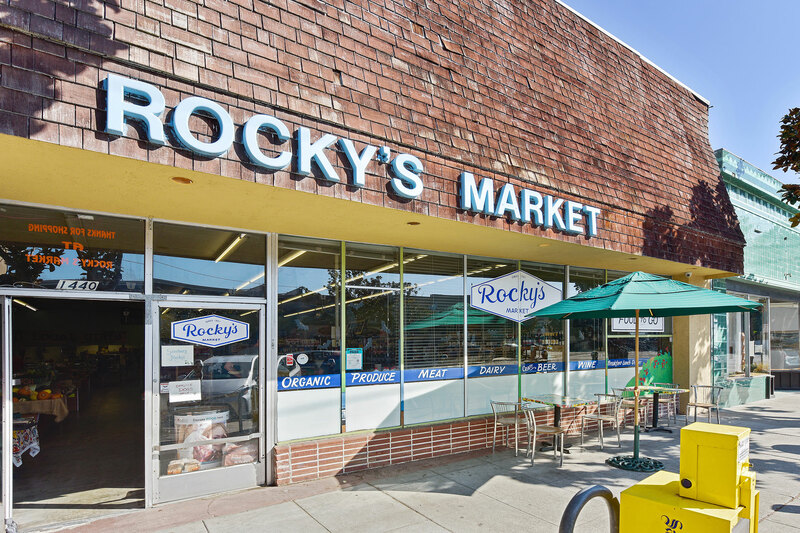 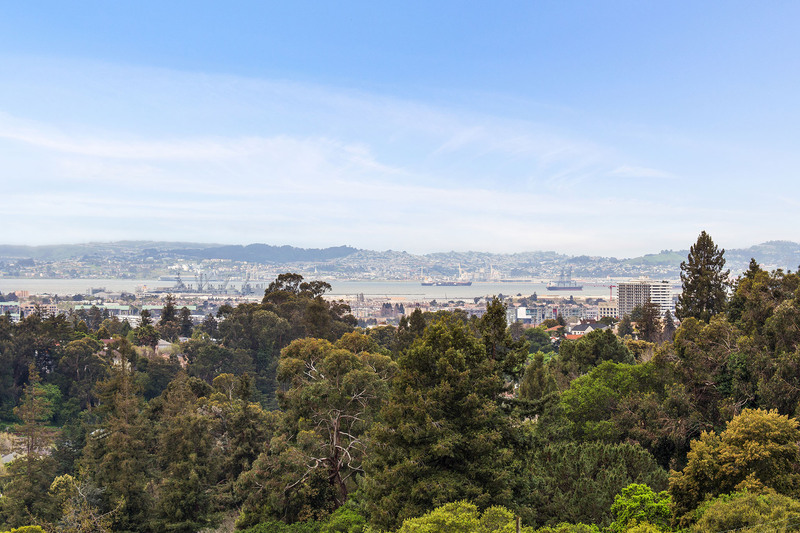 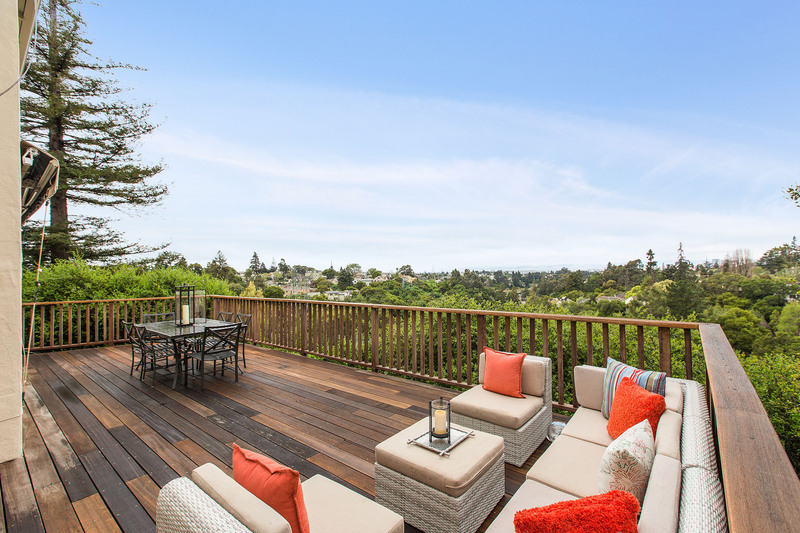 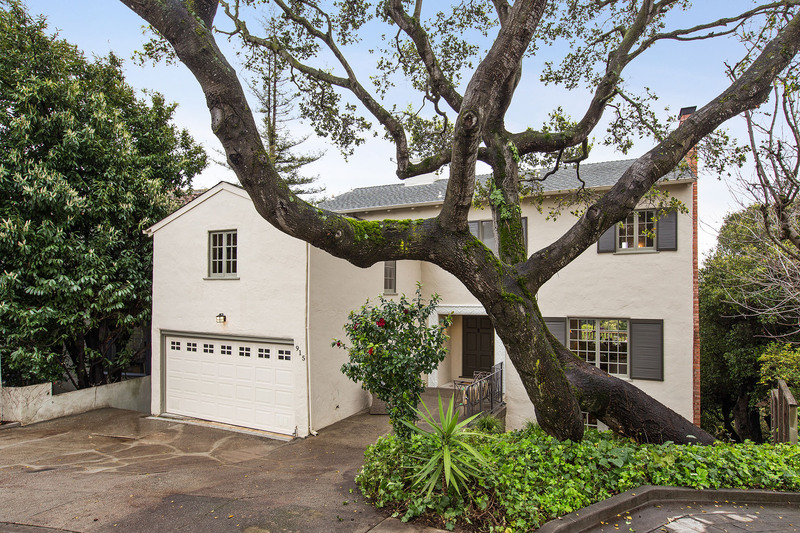 An oasis in the center of vibrant Oakland, it’s no wonder so many want to call Glenview ‘home’! 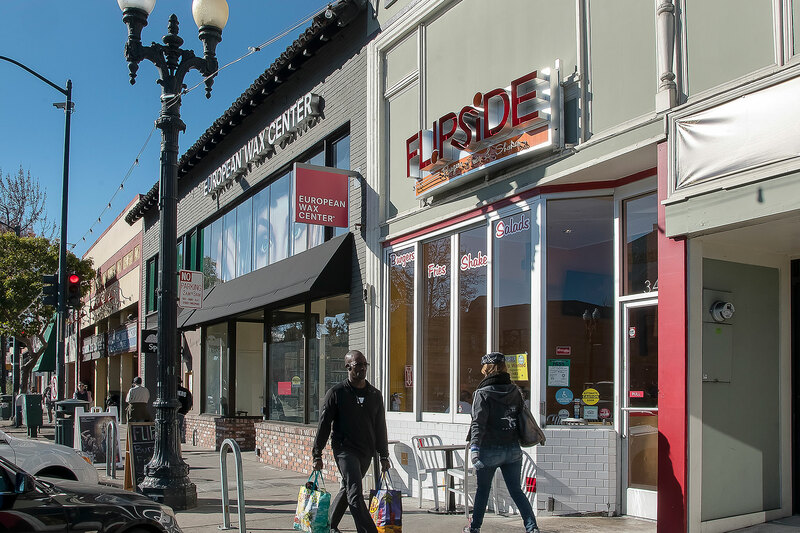 The Glenview neighborhood is a mix of quiet comfort and urban amenities, and despite being a part of the big city, Glenview feels like a small town. 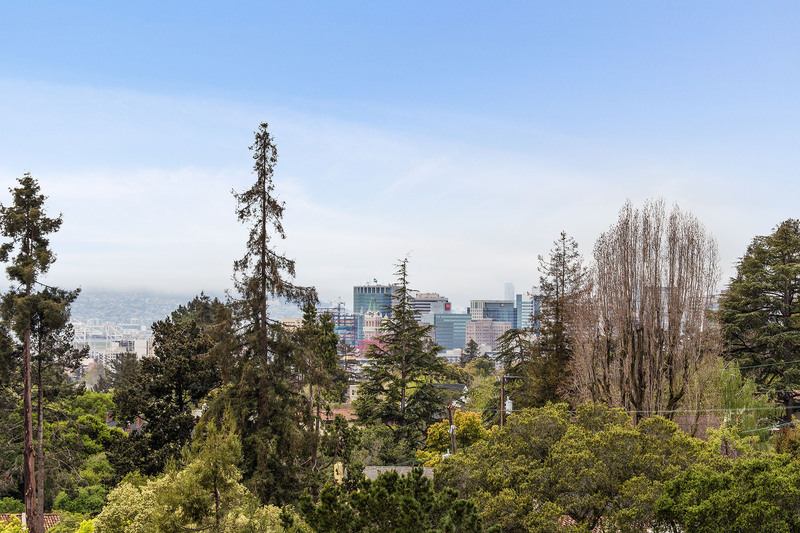 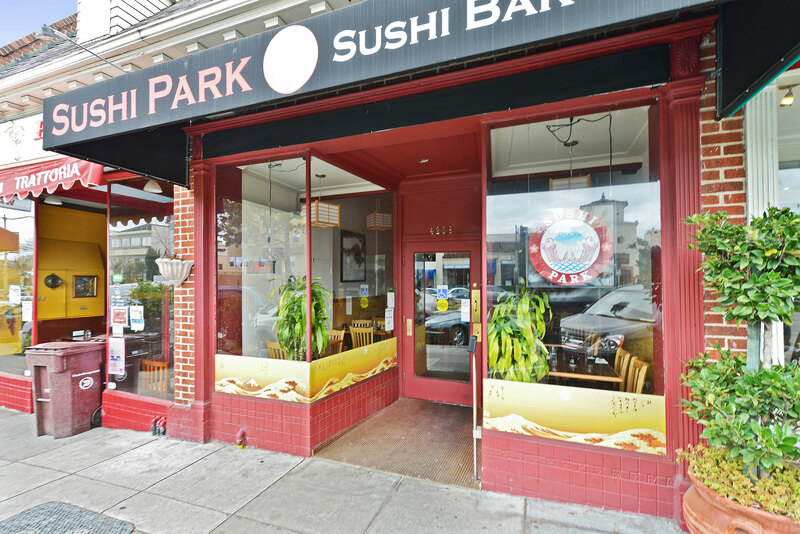 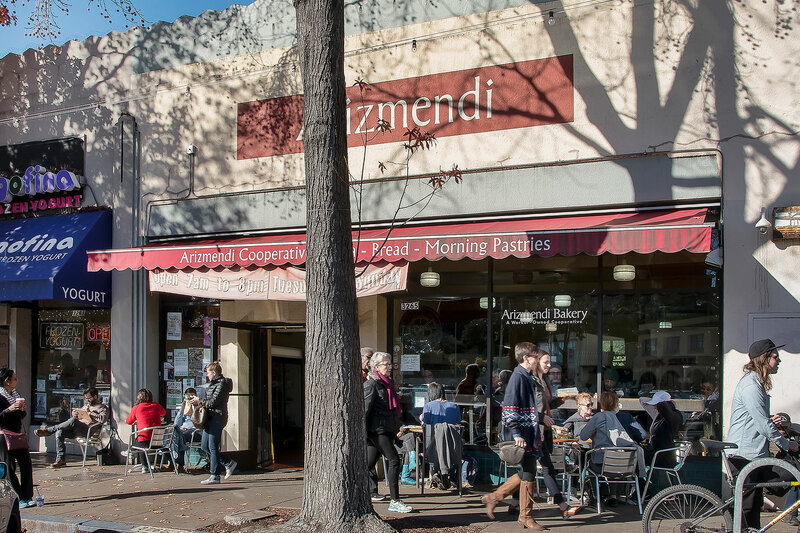 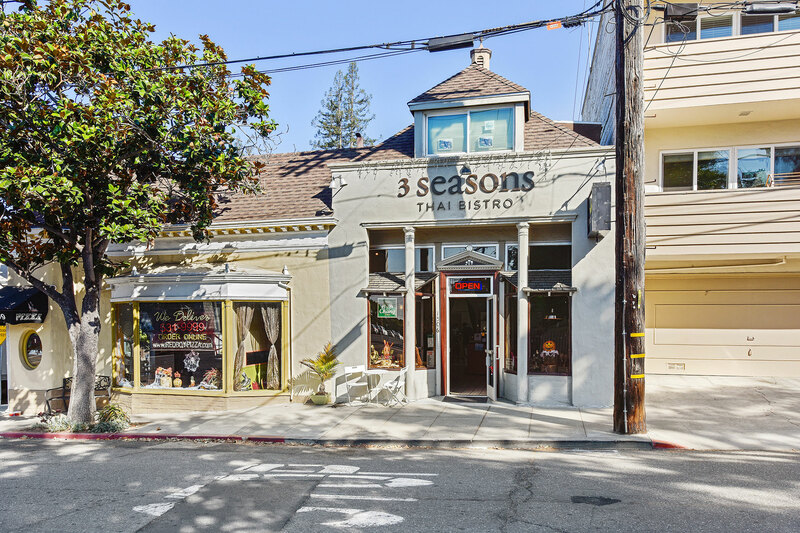 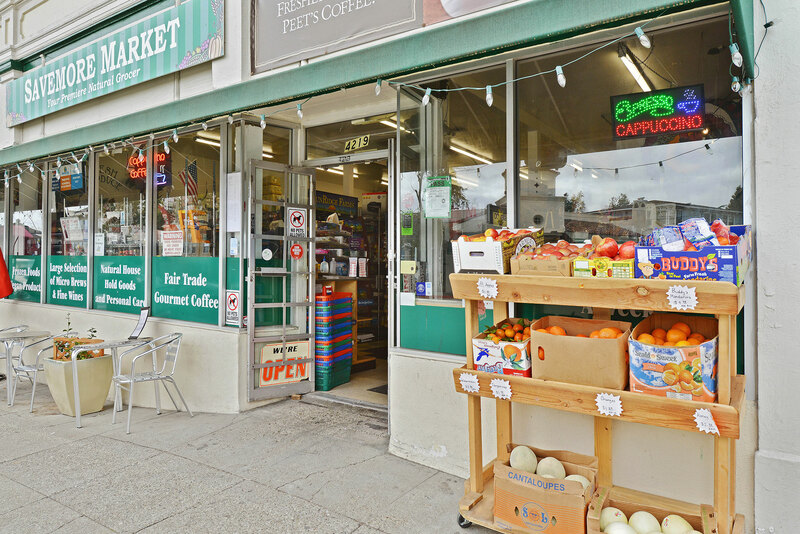 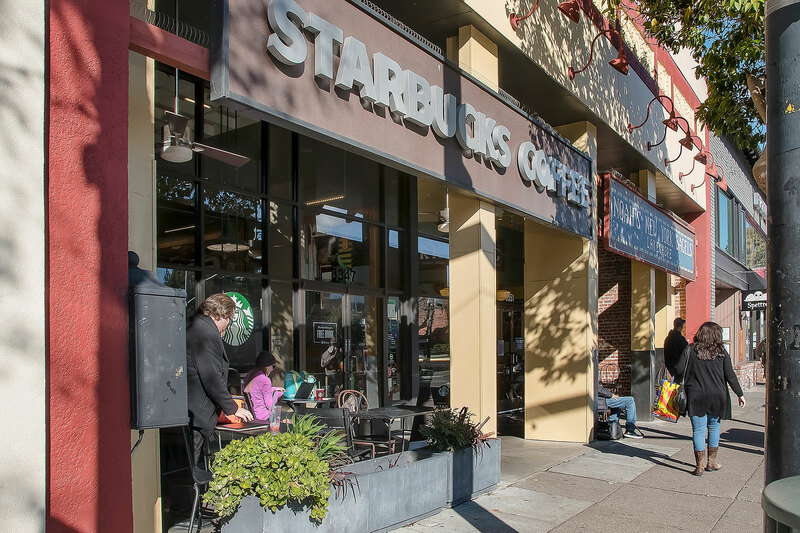 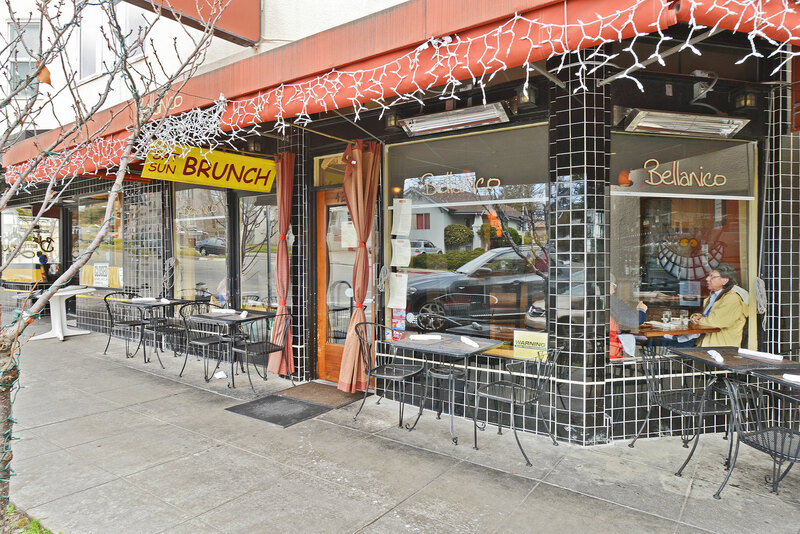 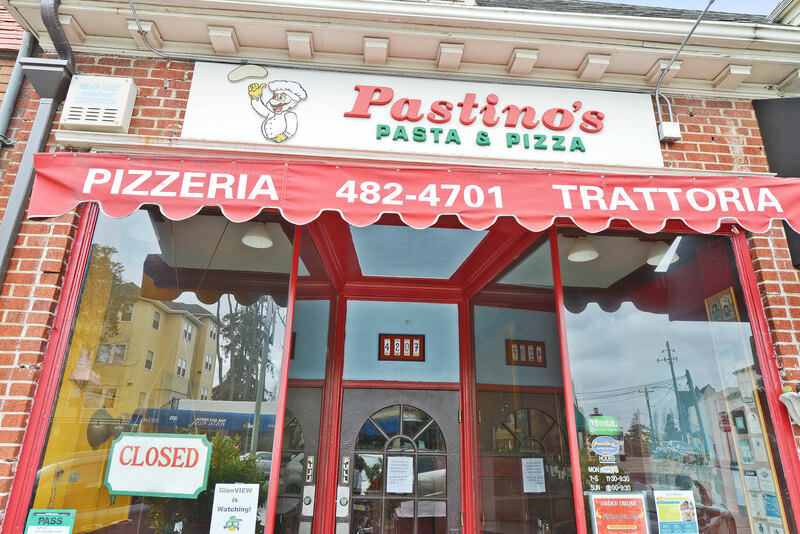 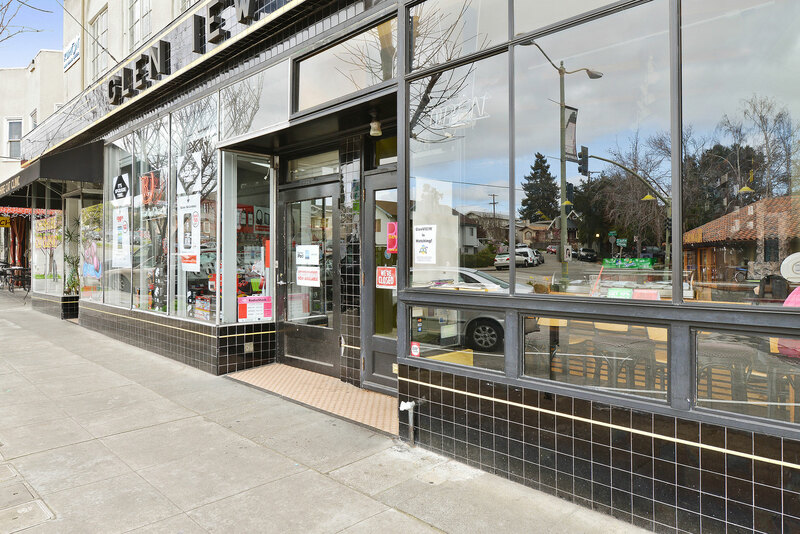 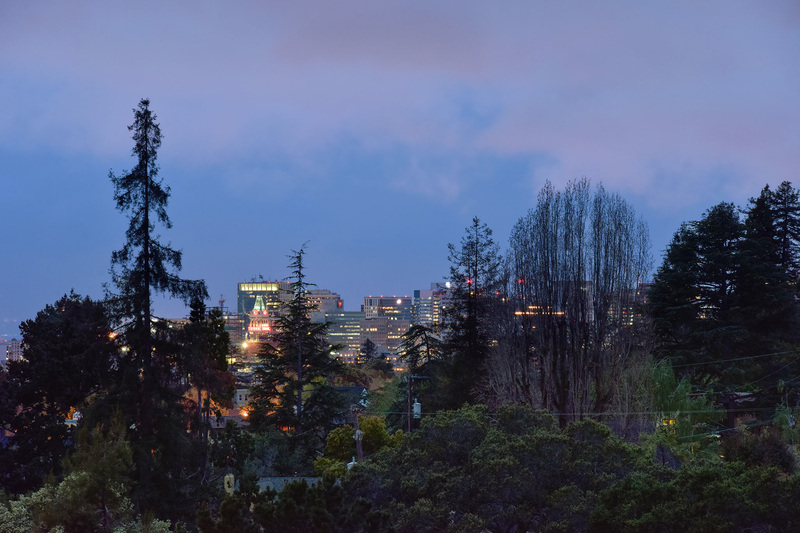 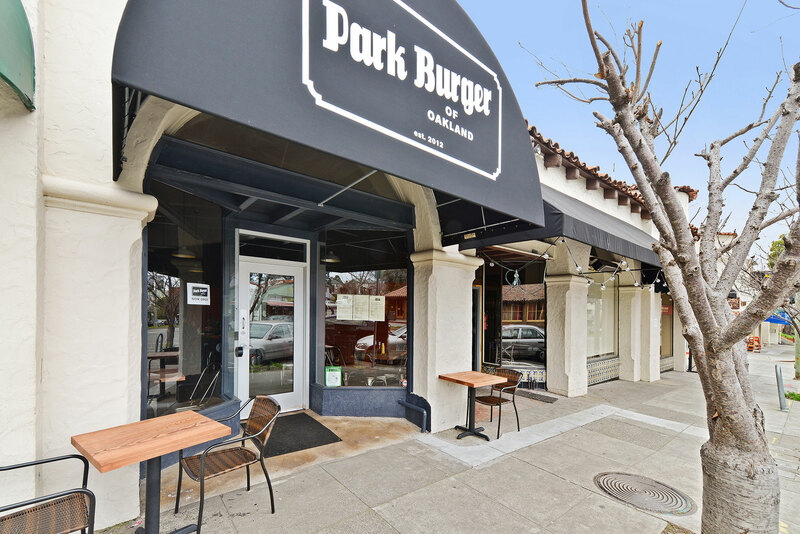 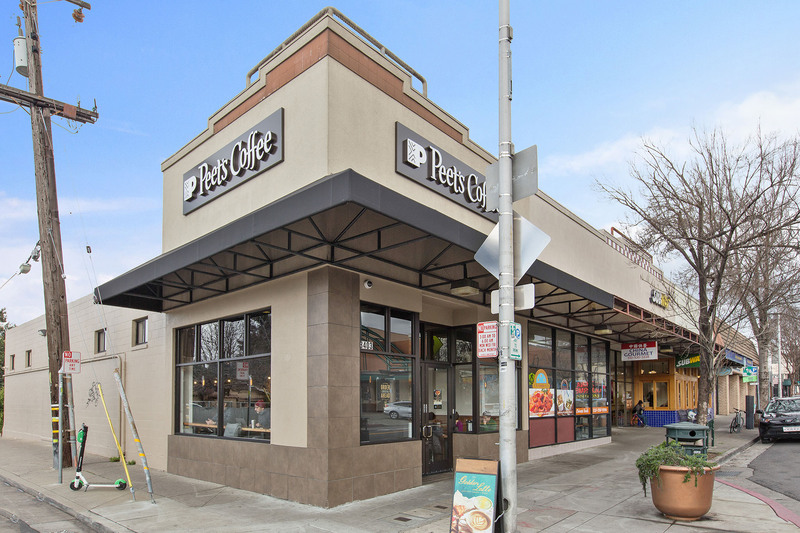 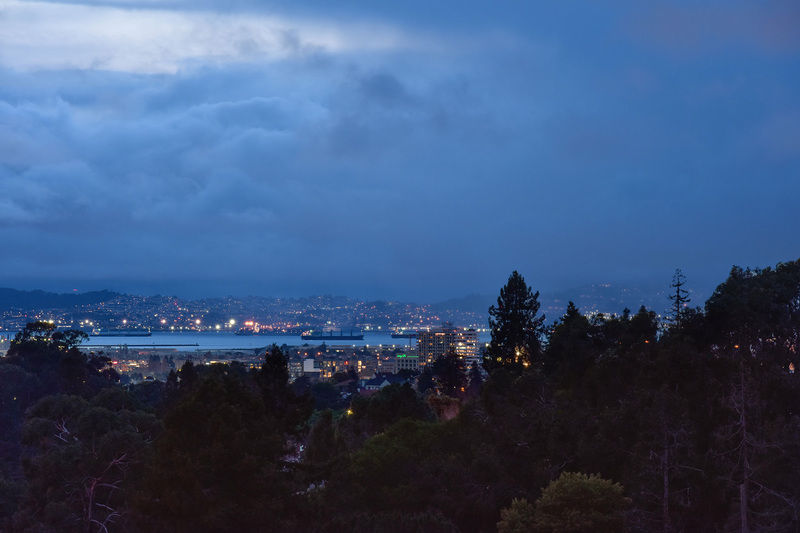 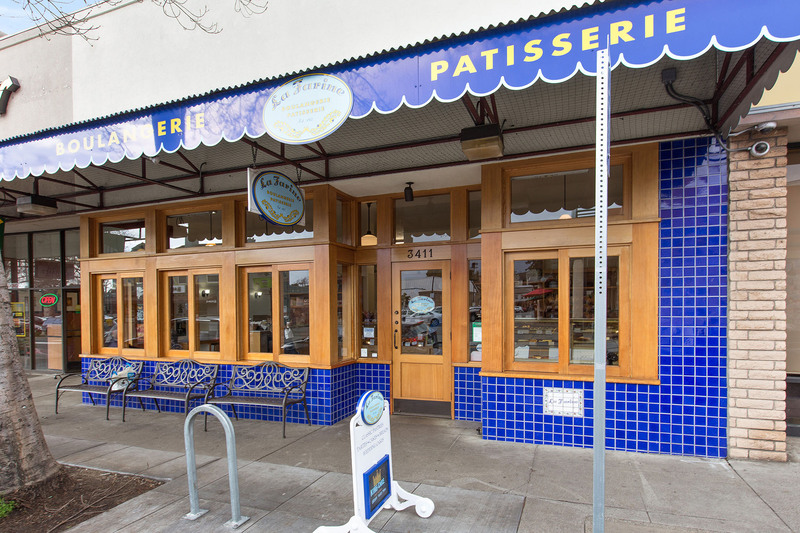 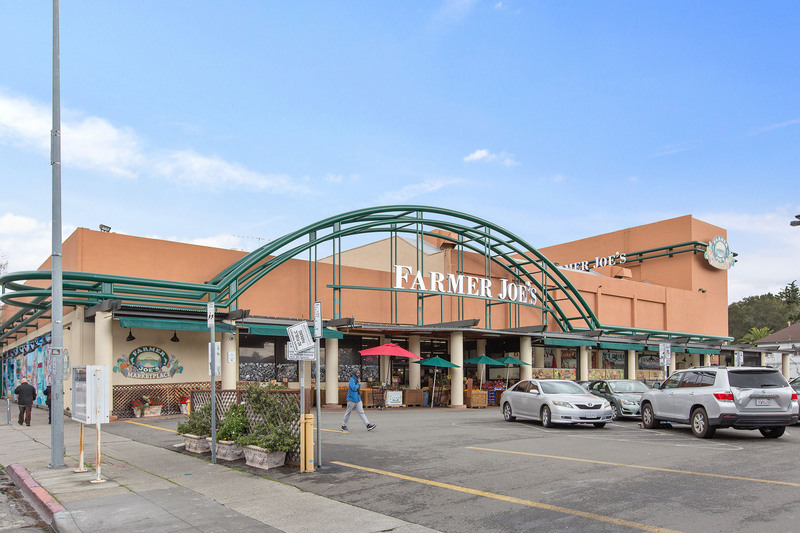 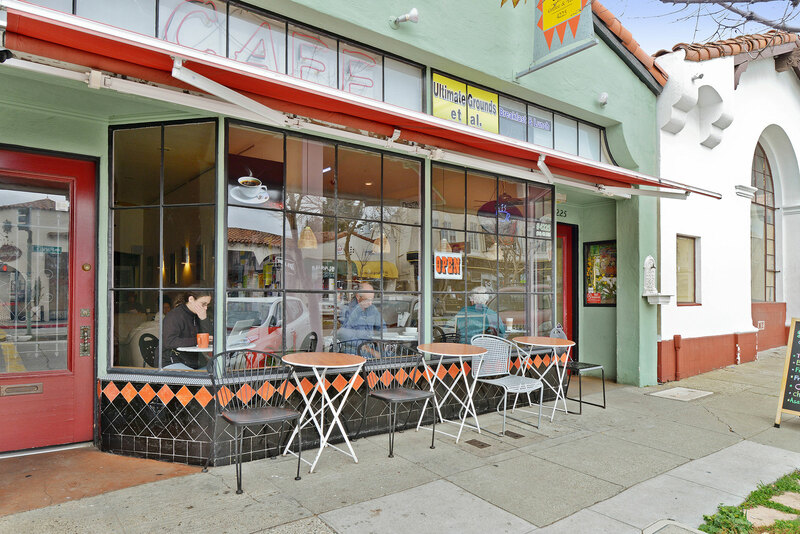 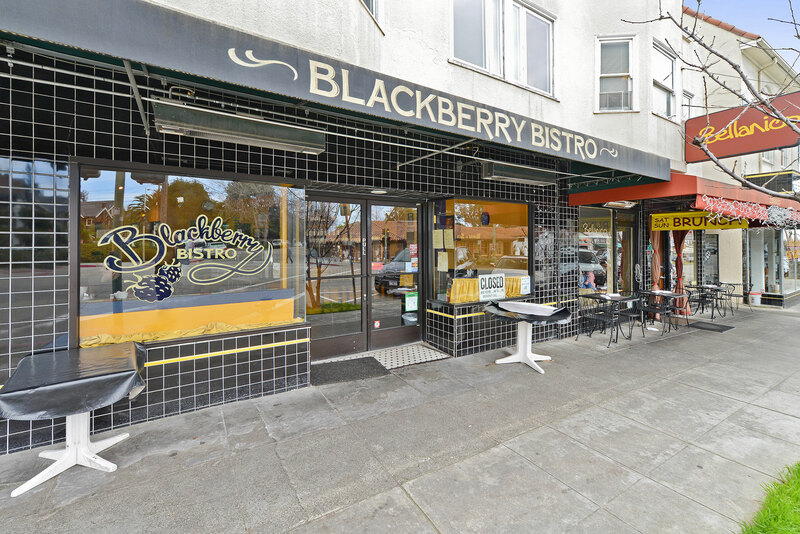 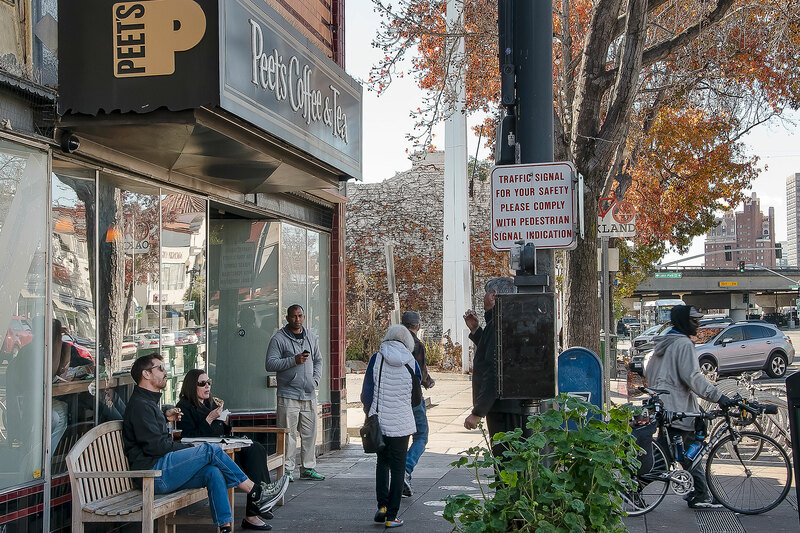 A stroll away, Park Boulevard is home to a vibrant mix of restaurants and shops; Dimond Park has a pool, a playground, a creek and the oldest oak tree in Oakland. 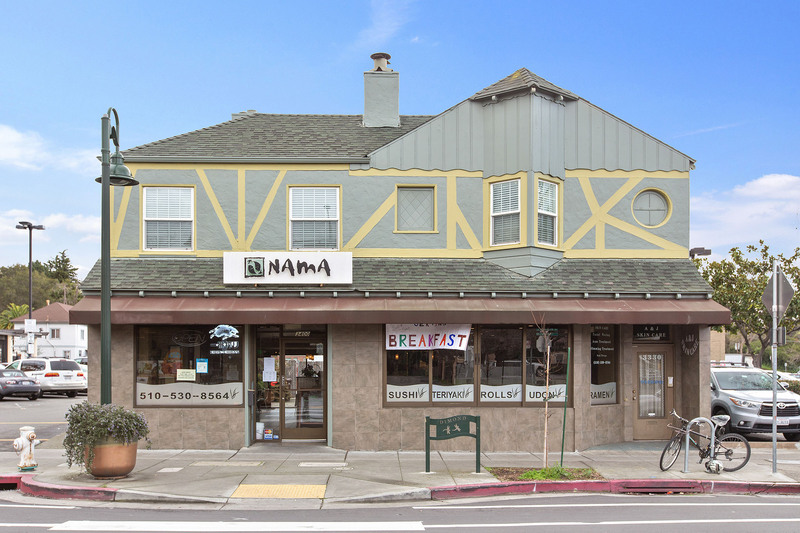 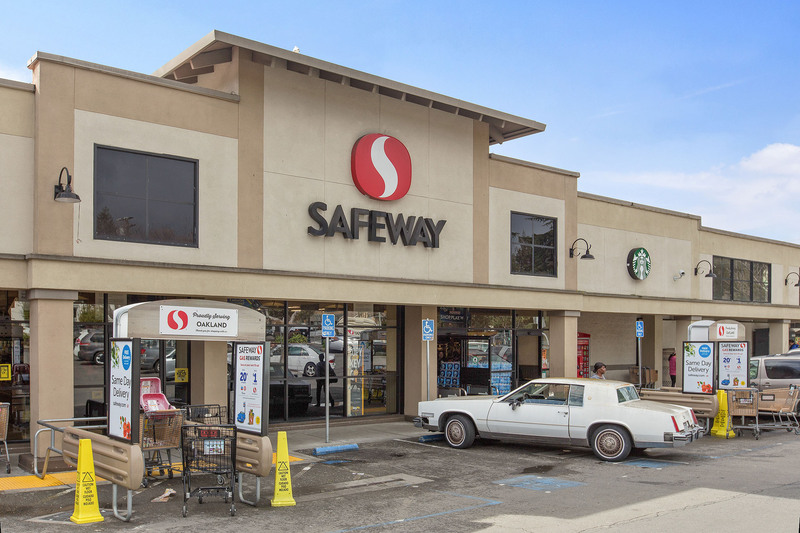 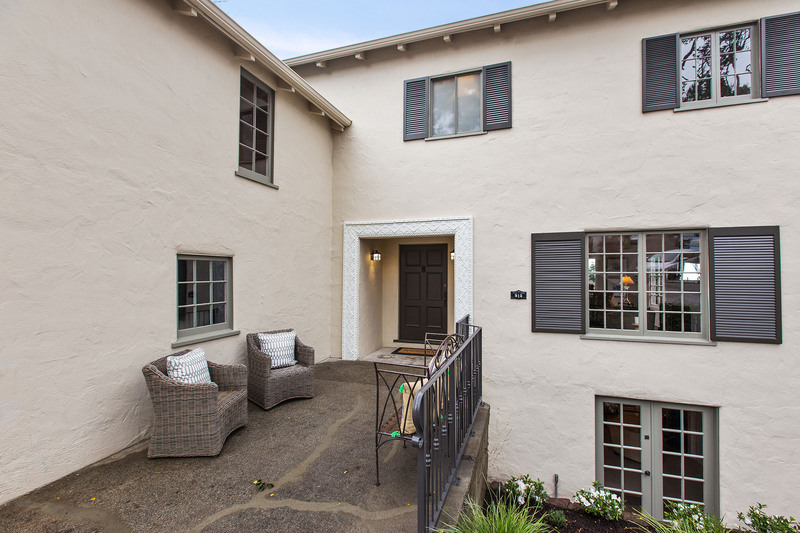 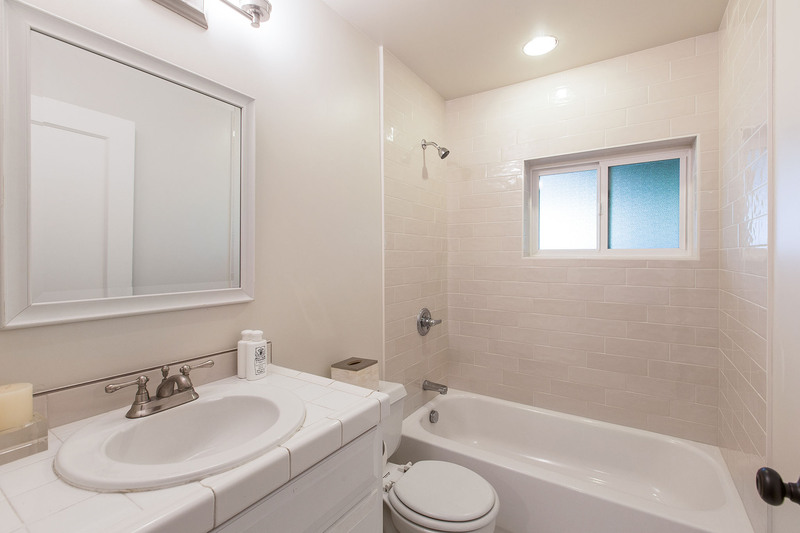 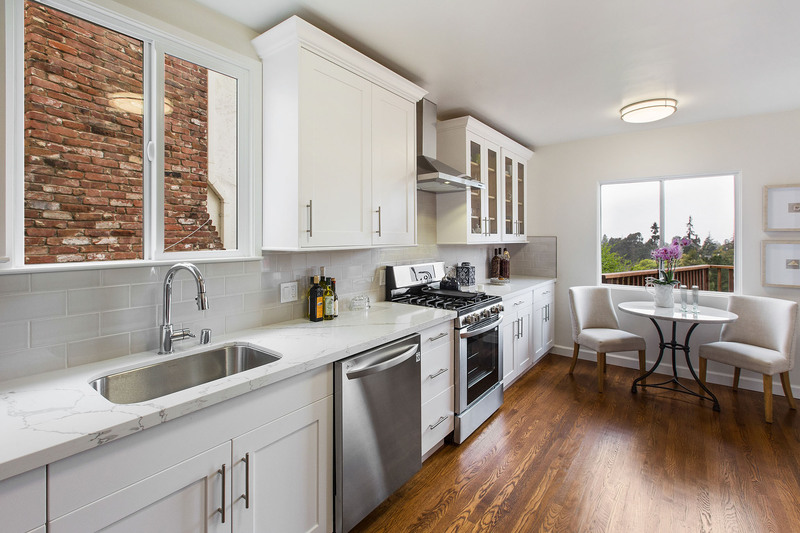 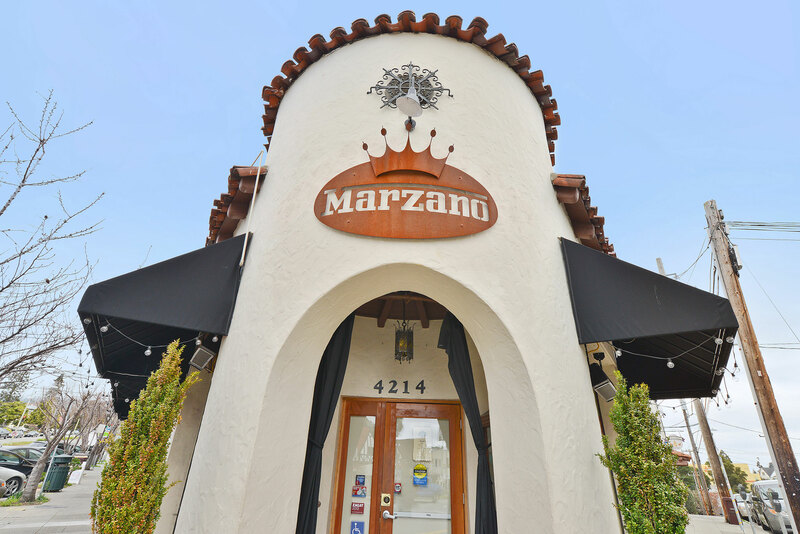 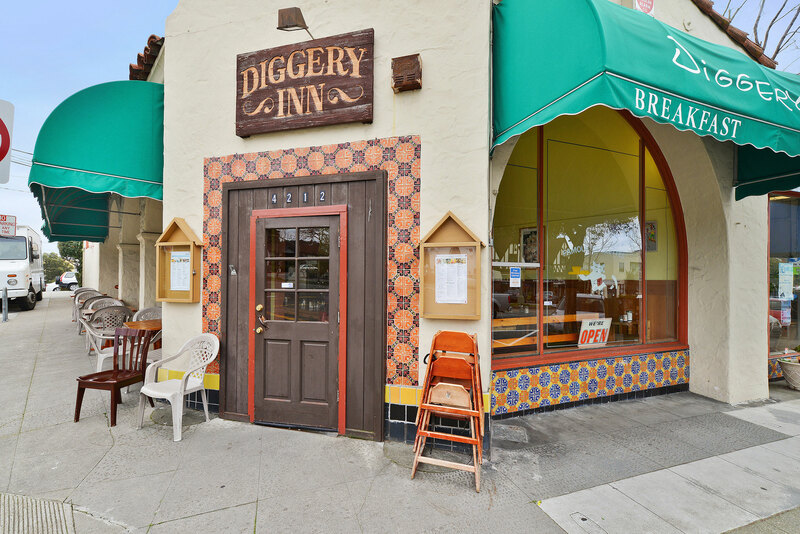 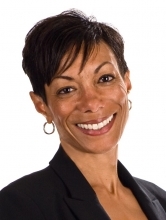 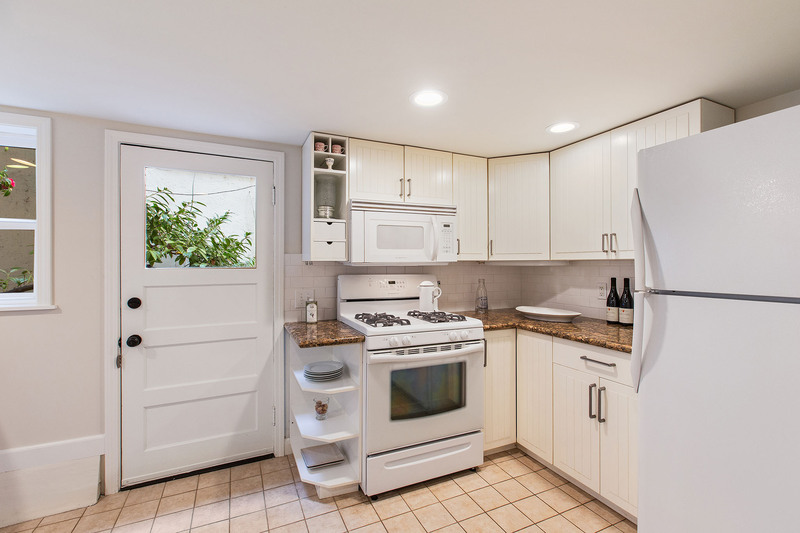 If you need to hit the road, there is convenient access to casual carpool, AC Transit, and freeways. 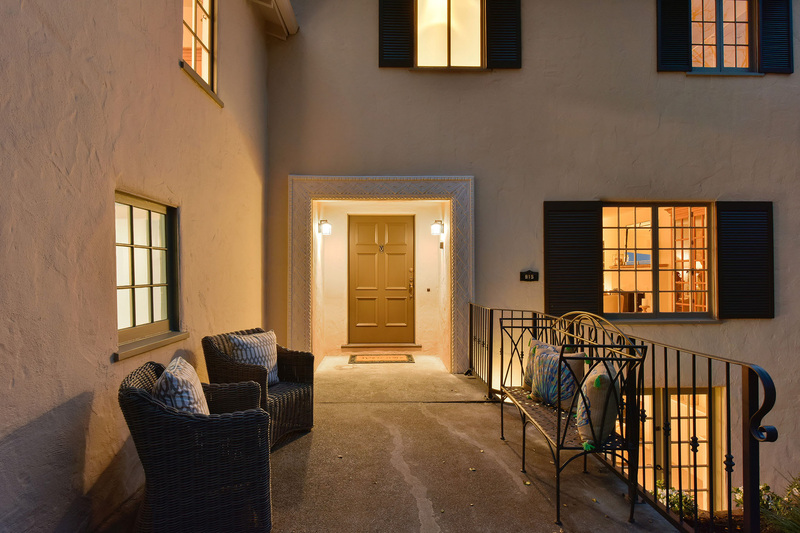 Pretty streets, interesting architecture, a strong community, and easy walkability make Glenview a neighborhood residents are glad to call home.